Hello and Happy Friday friends! We’re finishing up Happy Jig Week with a roundup of project ideas created by our amazing in house design team. 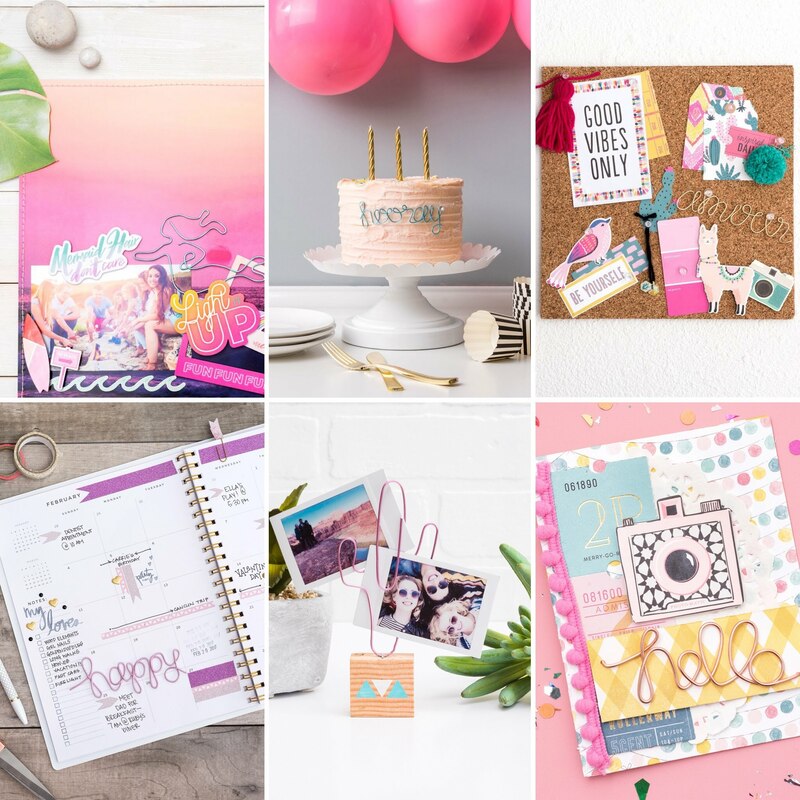 There are so many ways to use your Happy Jig creations–take a look at a few project ideas below, and enjoy the inspiration! 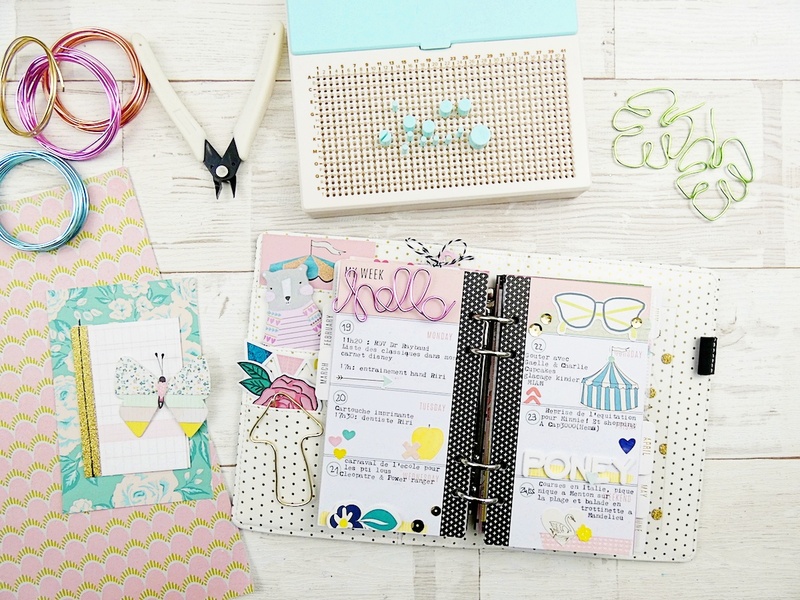 Add custom titles and embellishments to your scrapbook pages with the Happy Jig! 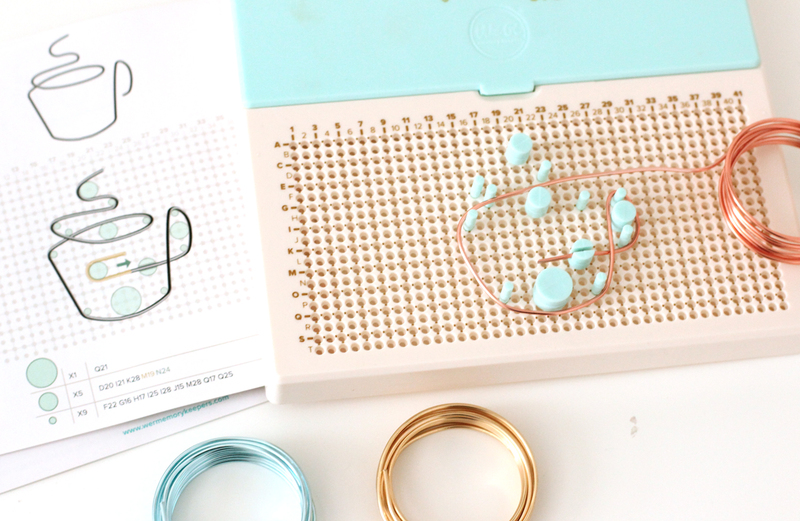 Choose your wire color, and your design, and add a personal touch to your memories. 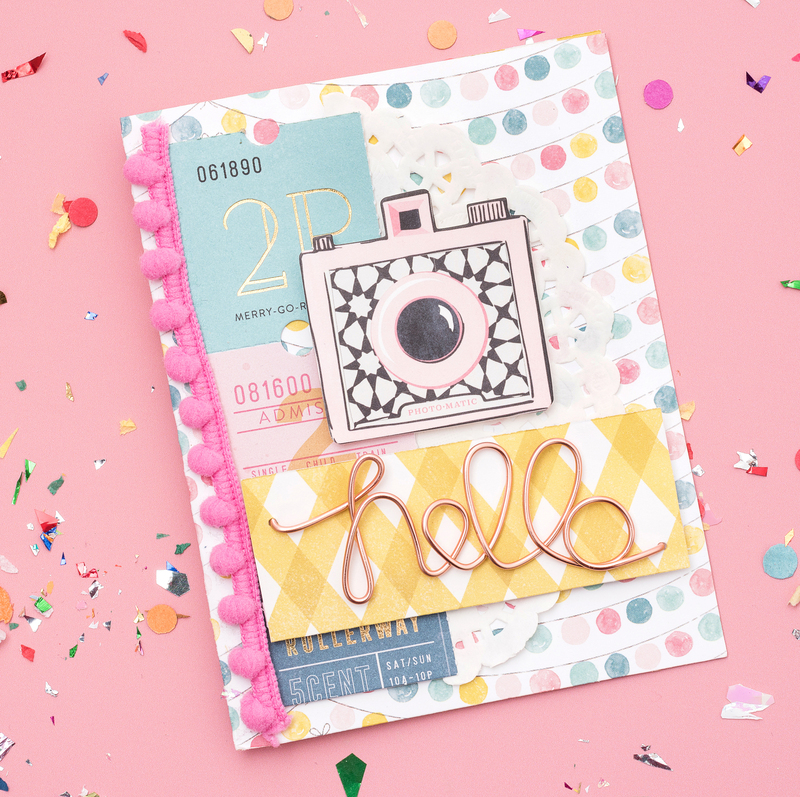 Create your own card sentiments with the Happy Jig! 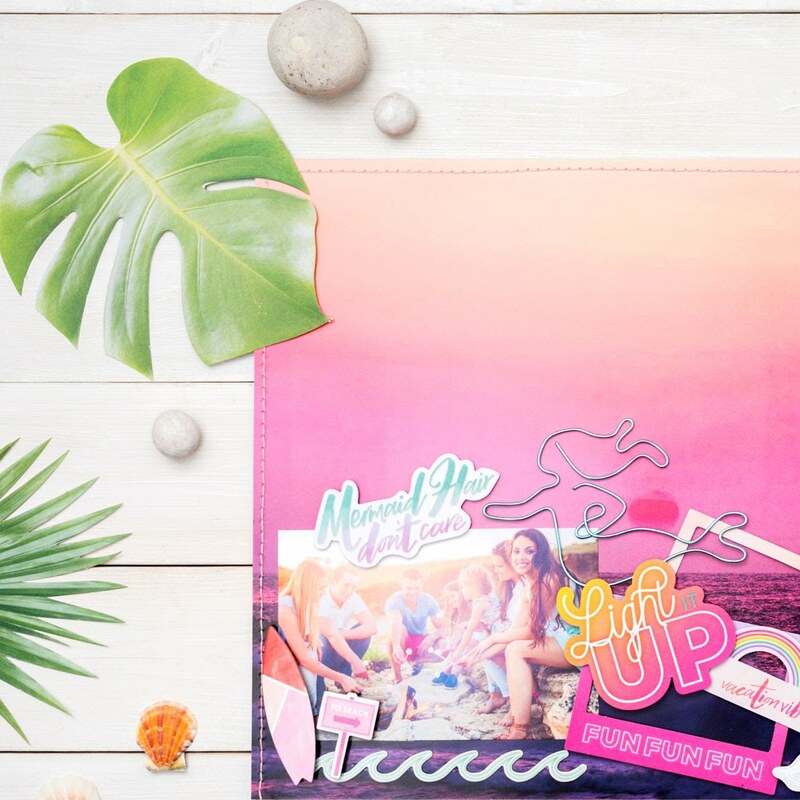 Use one of our designs from the instruction manual, or our @werhappyjig Instagram feed, or create your own. 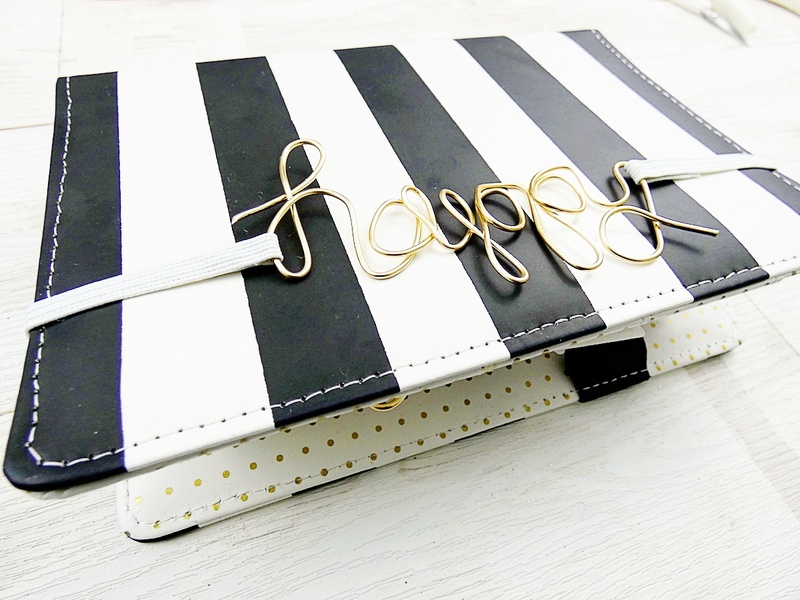 Add accents, paper clips, and titles to your planner. They’re easy to make with the new Happy Jig! 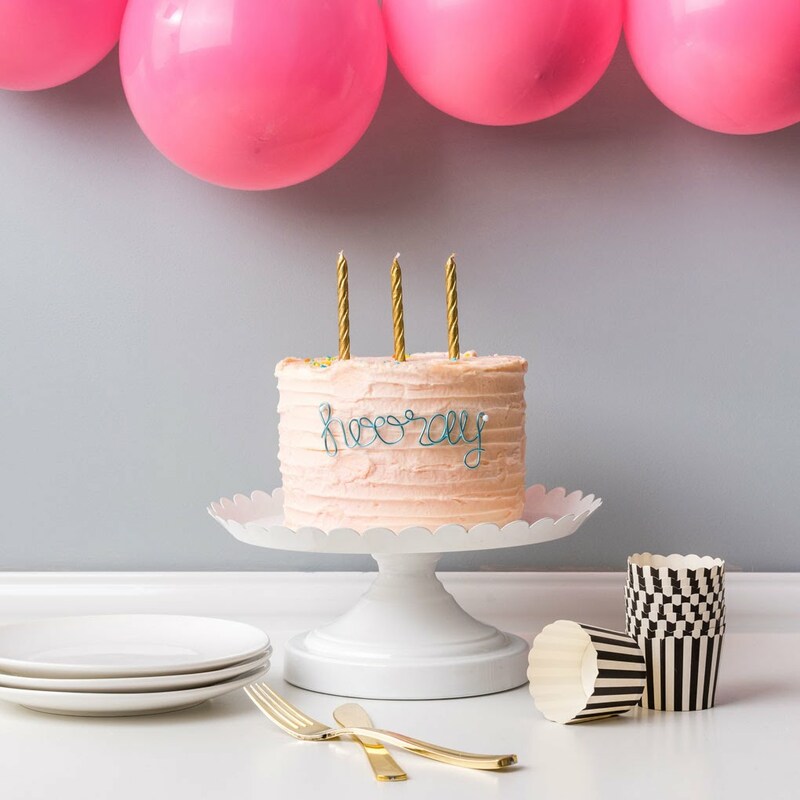 Spice up or personalize your party decorations with the Happy Jig! Easily add names, dates, and other details in your choice of color. 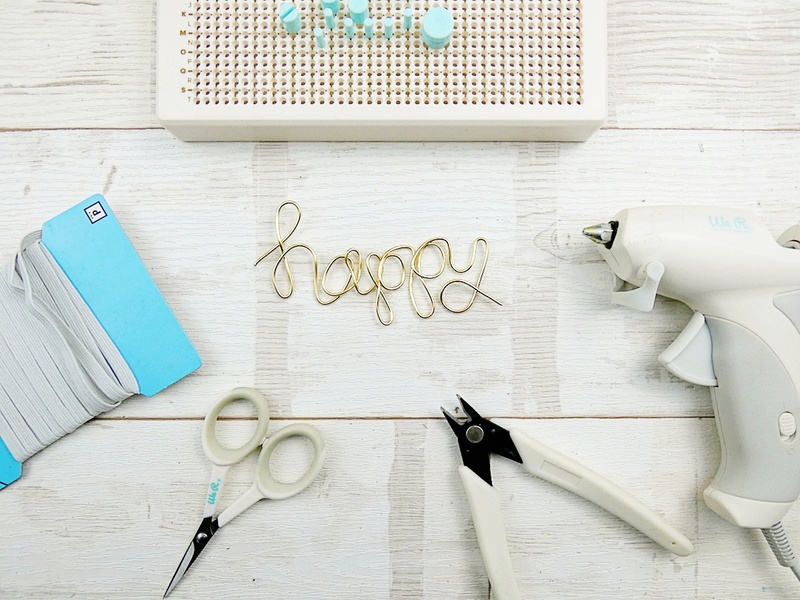 Customize your handmade home decor with the Happy Jig. 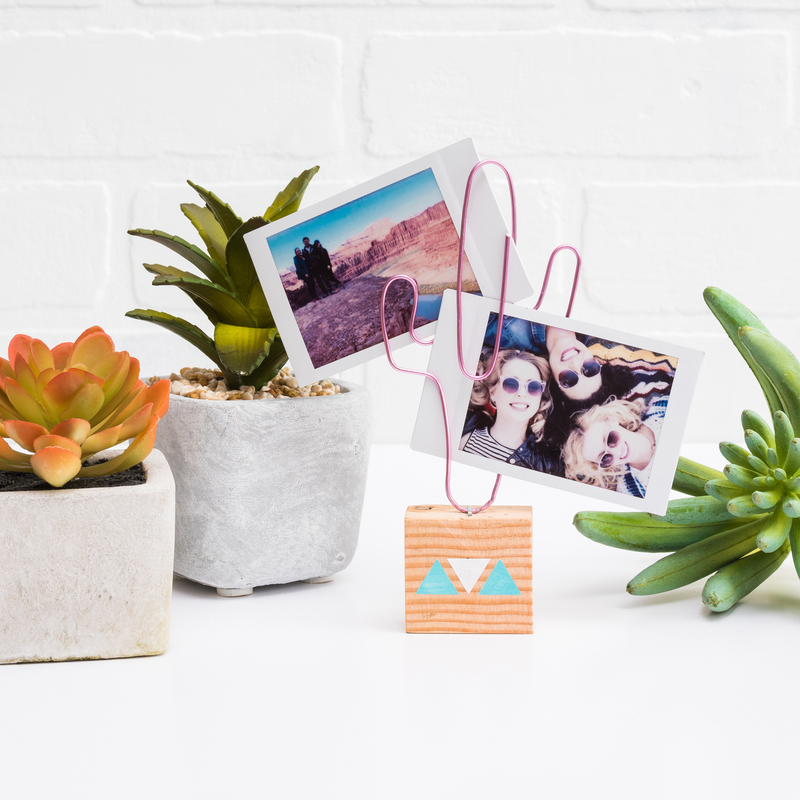 We just love this adorable cactus photo display! 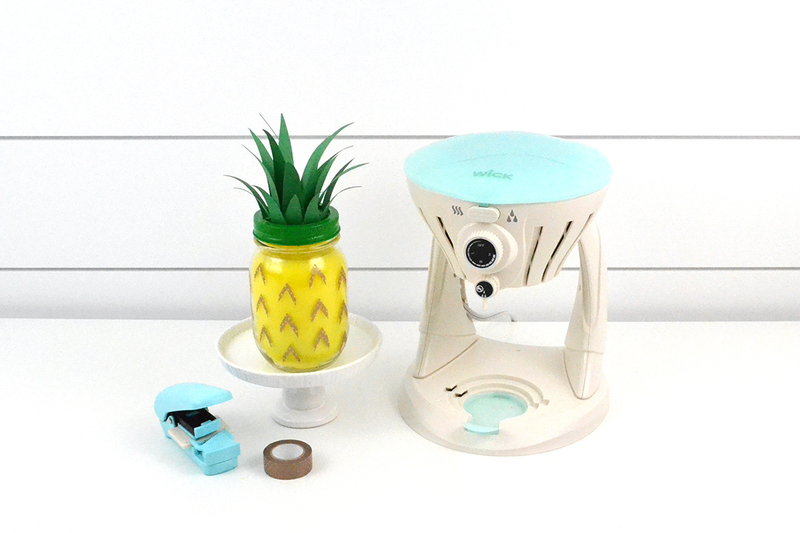 Label your cork board, storage containers, or command center with the Happy Jig! 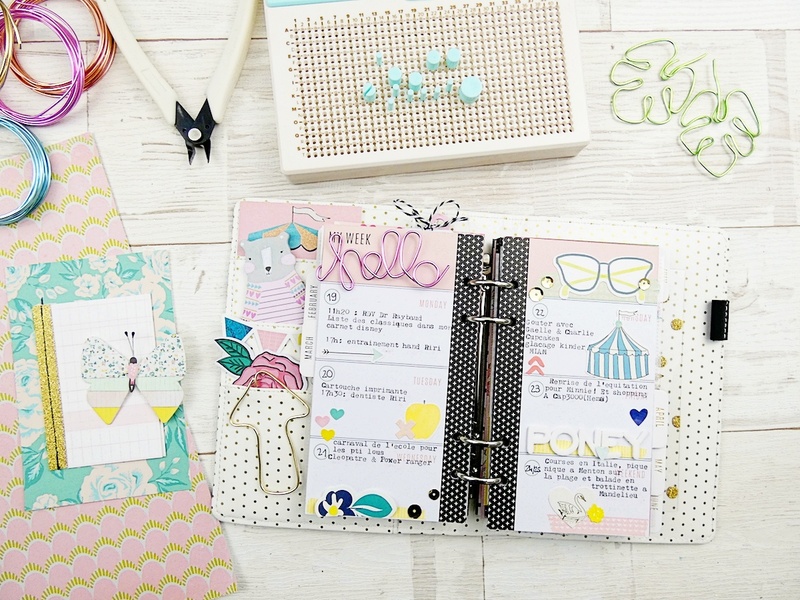 Keep your life organized in style. Thanks for stopping by. We hope you’ve found some helpful ideas. 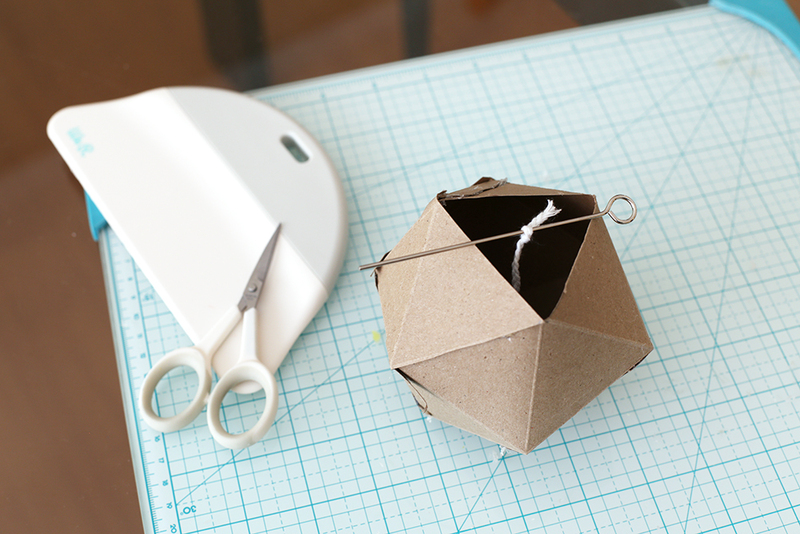 Have a great weekend, and happy crafting! Hello everybody! 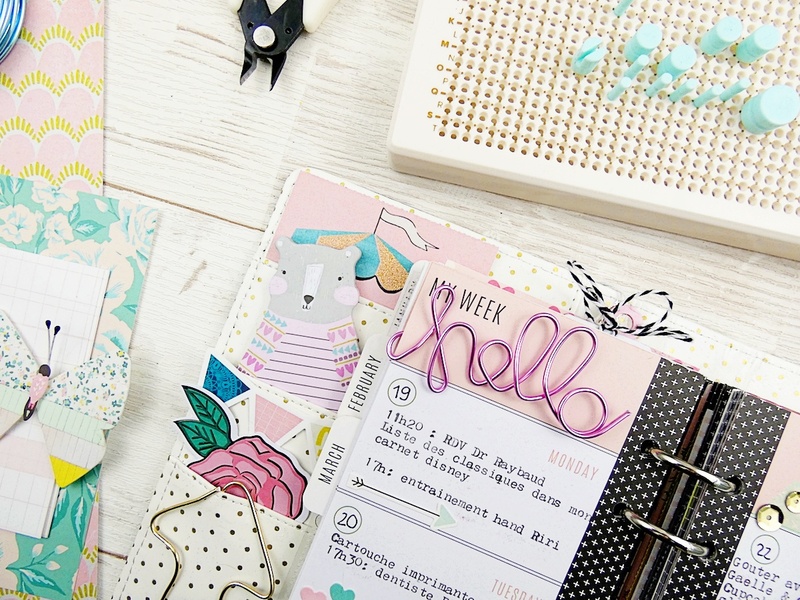 Soraya here with you today for a new planner project using the amazing Happy Jig. 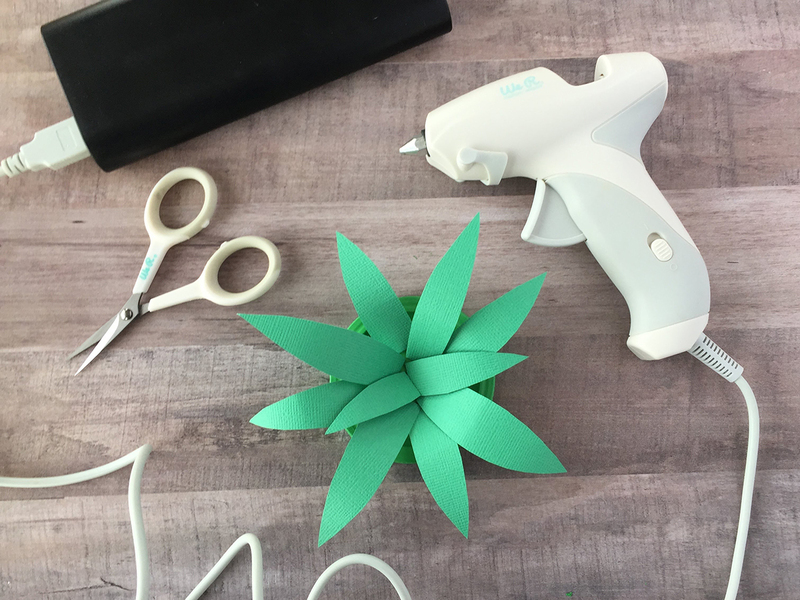 I love how fun and easy this tool is, you can really make any design or shape you want. 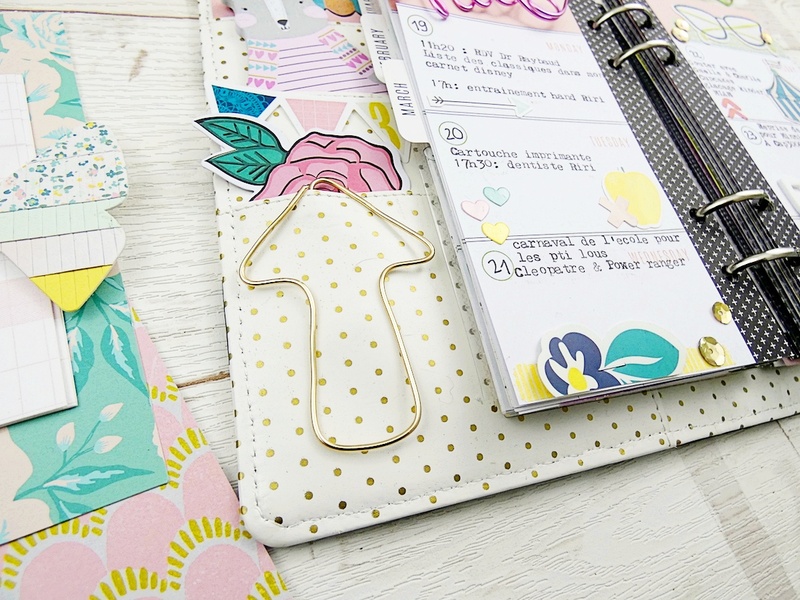 Let’s make a paperclip and a planner closure band together! 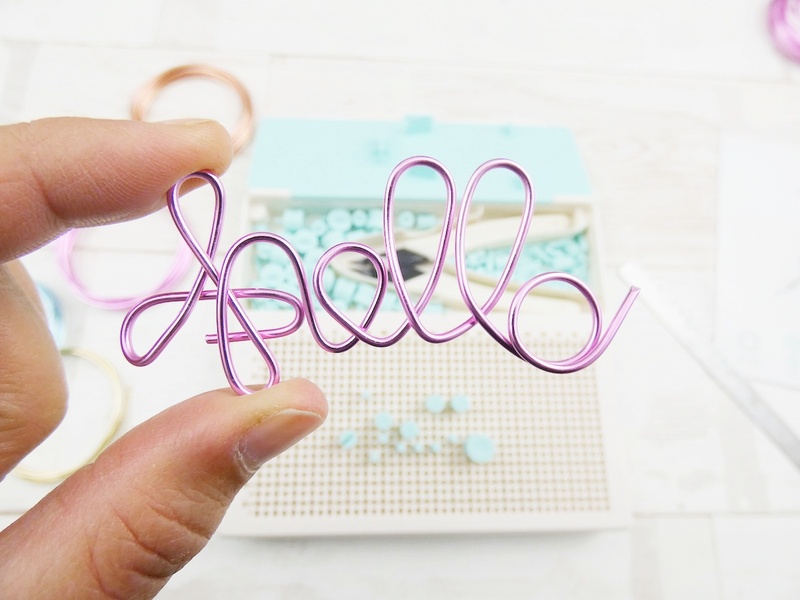 To make the “hello” paperclip, I followed the instructions in the booklet and cut the correct amount of wire (17inch). Then I placed all the different pegs on the board and started to shape the word. 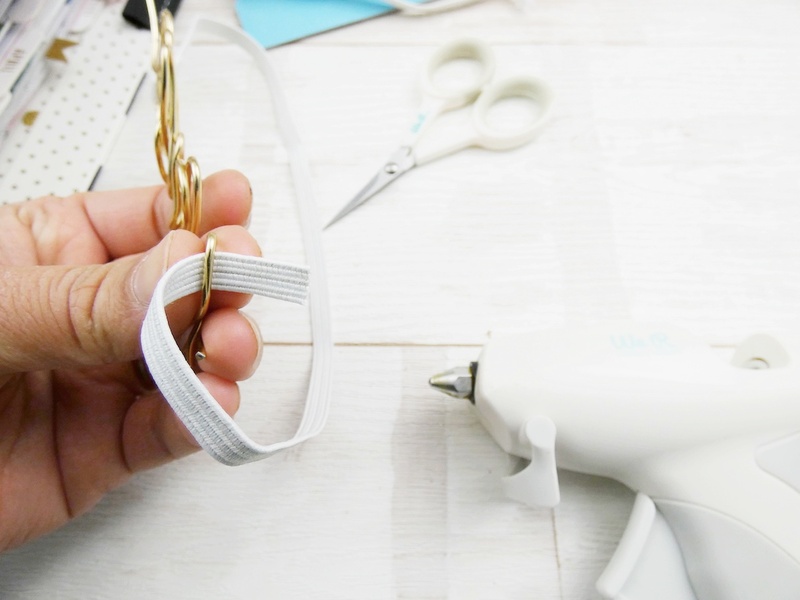 The wire is so flexible and sturdy in a same time that it makes it very easy to use. 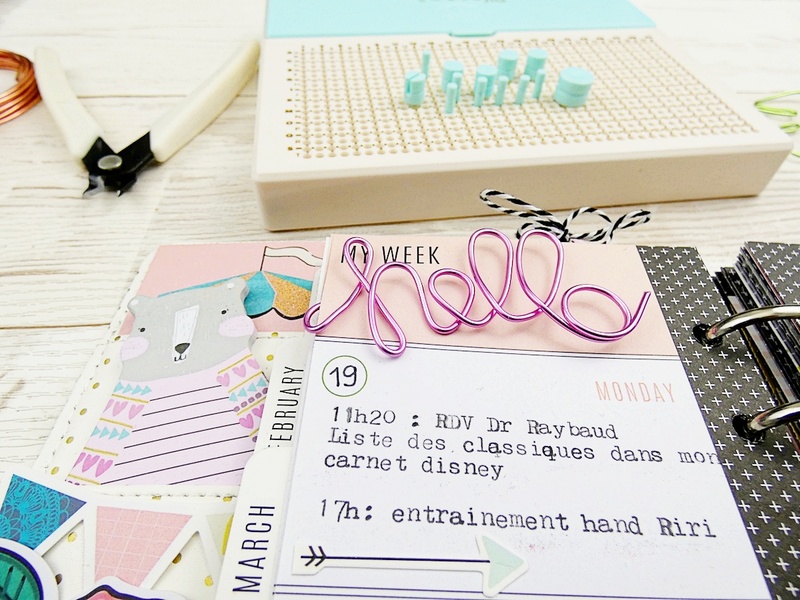 And here is the beautiful paperclip specially made for my planner! 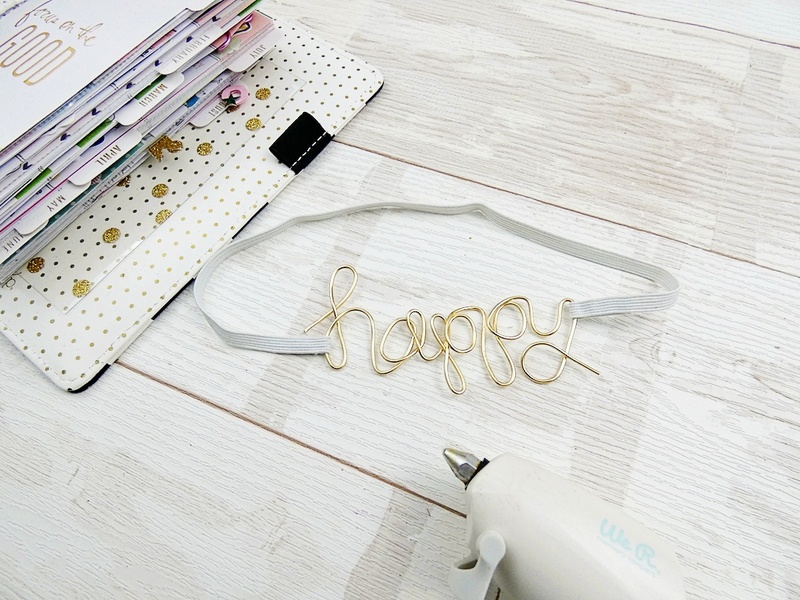 To make the planner closure band you will need white elastic, scissors, the new Crafter’s Essentials USB Mini Glue Gun and the word “happy” (previously made with the Happy Jig). 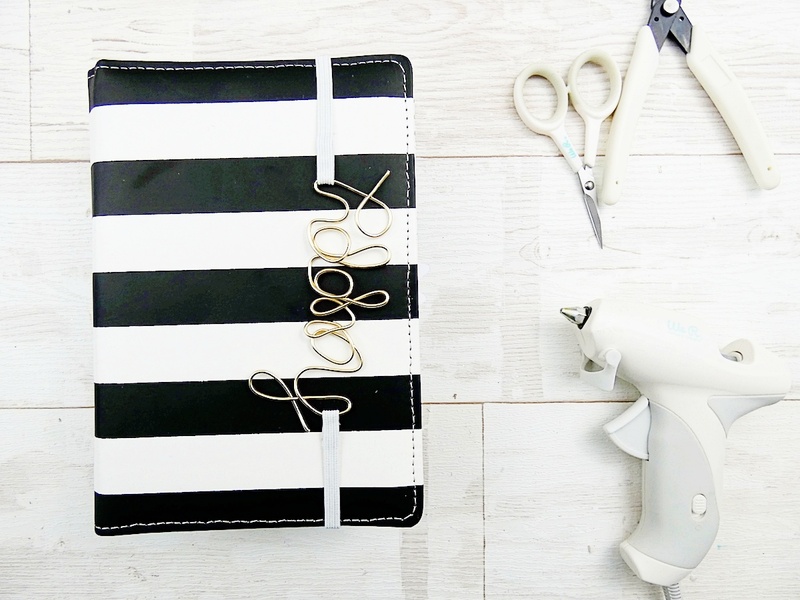 First of all, cut the white elastic to the right length in order to fit around your planner (don’t forget to leave one inch more for the edges). 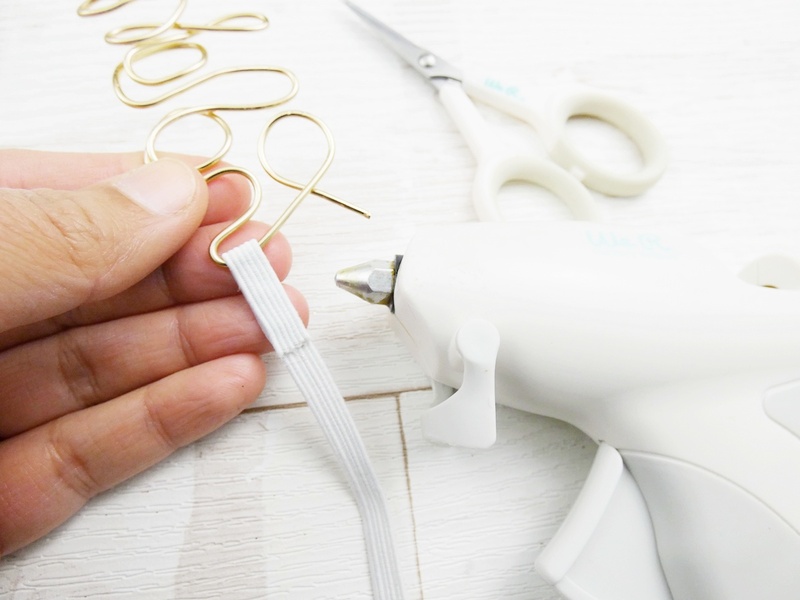 Pass the elastic through the word and stick the ends using the glue gun. Your planner band is ready! How easy and fun! I Hope you had fun joining me today, you will love creating with your Happy Jig! Until next time! Hey there We’R fans, Nancy here with a closer look at the Happy Jig. It’s a way to re-wire how we thinking about crafting. The Happy Jig lets you create custom words and shapes in a rainbow of colors. 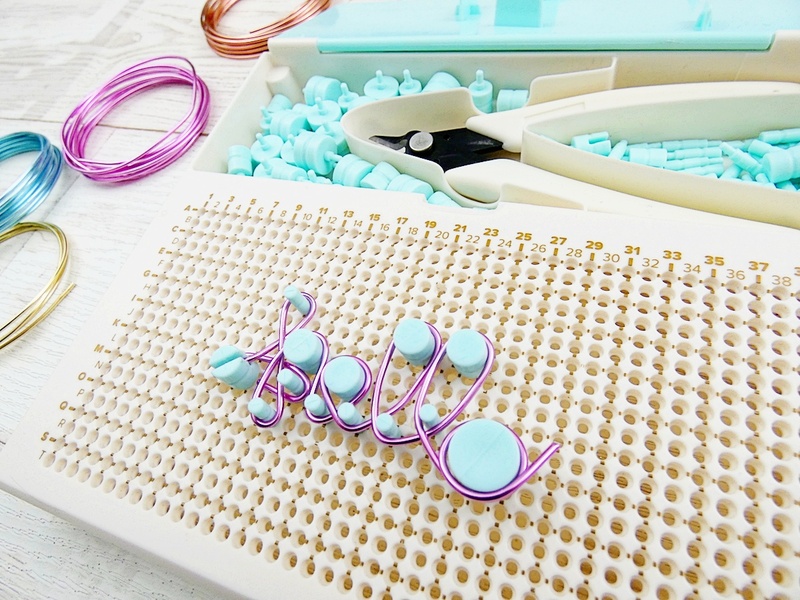 Now let’s take a look at how to create a simple embellished card. 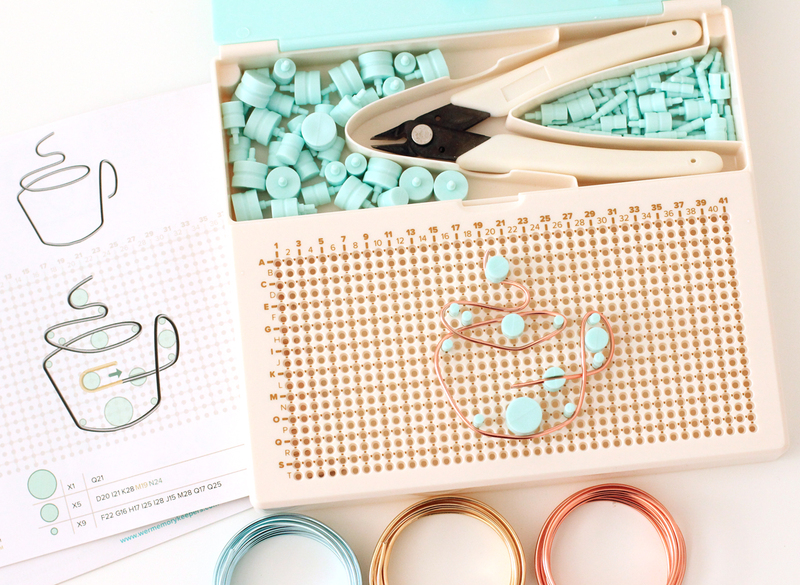 Start by using the Happy Jig guide book to place small, medium and large pegs in the grid for the design you have chosen. 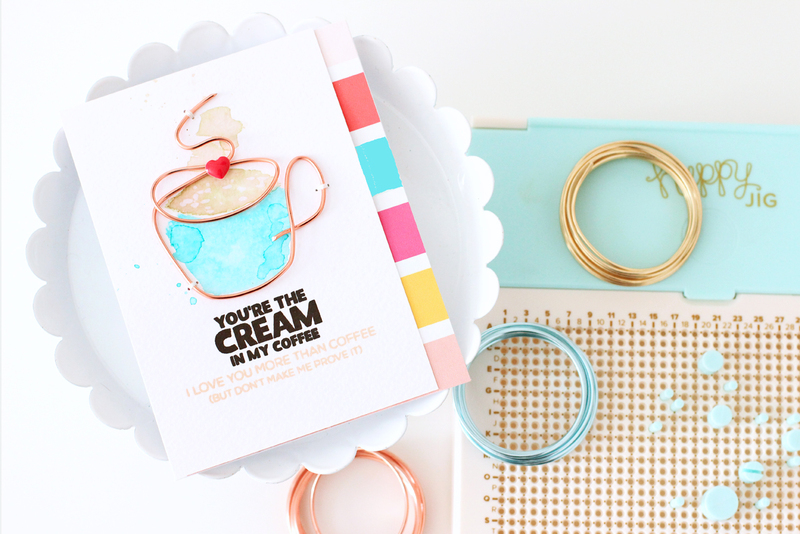 Here, I chose the coffee cup and the rose gold wire to create this warm treat. The directions are easy to follow and this cup took me just minutes to create. You can also find additional design guides on the We R Memory Keepers Instagram account. I will be using graph paper to create some of the own custom shapes in the future! One of the best things I love about the Happy Jig is that includes storage right in the tool base itself. A place for the included wirecutters and pegs is convenient and neat – that’s my kind of organization. I like how easy it is the keep all of those little pegs handy. 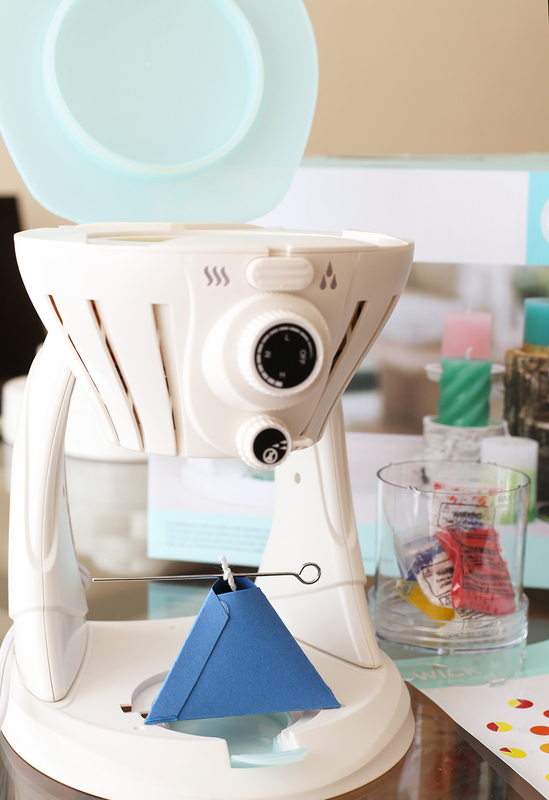 To adhere the lightweight wire shape, use embroidery floss and a few stitches to sew it to the background. 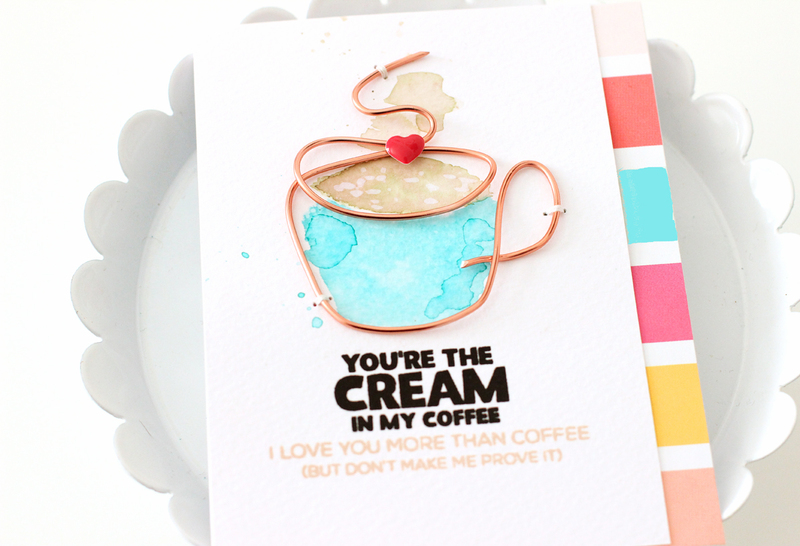 Next, use watercolors to add color to the center of the coffee cup shape. Stamp the sentiment and adhere a border of patterned paper to the edge of the card. 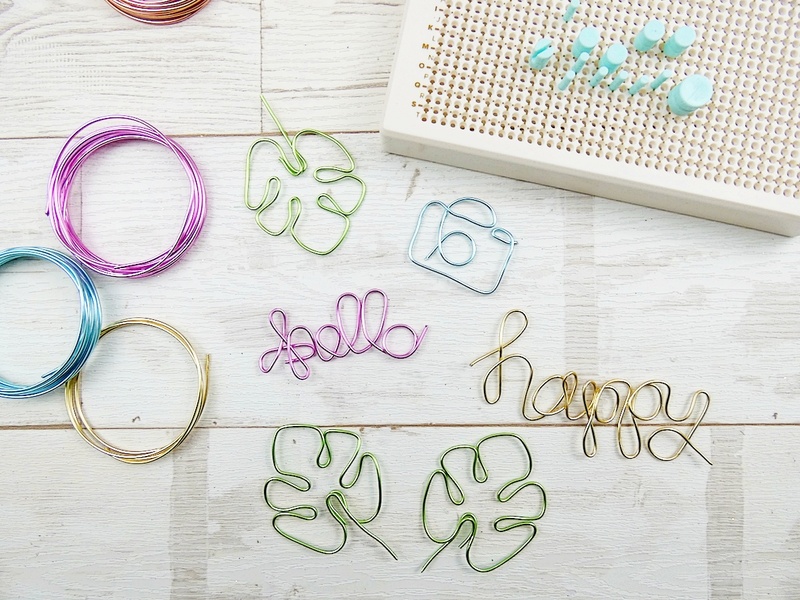 The Happy Jig is such a fun and innovative way to make custom wire shapes. I love how flexible and easy the wire is to work with. The fun colors are an added bonus! 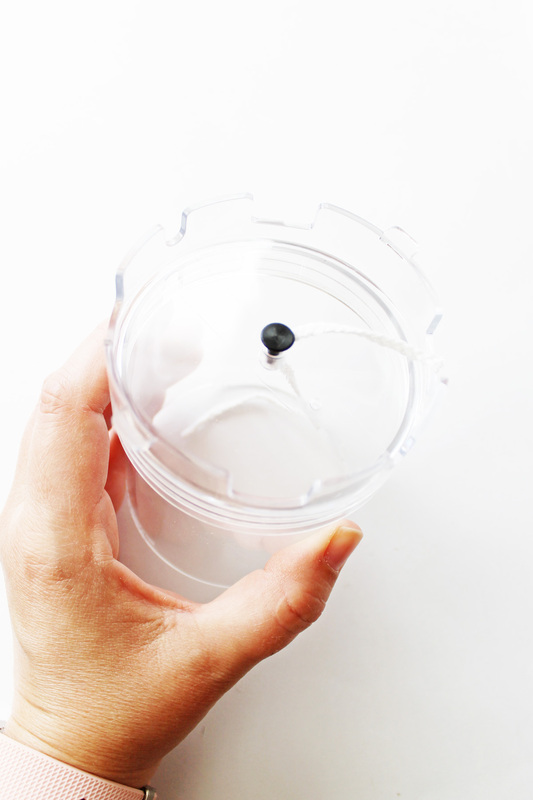 The Happy Jig is compact and contains storage for all components. It packs a wide variety of design possibilities and shapes! Hello WeR fans and welcome! 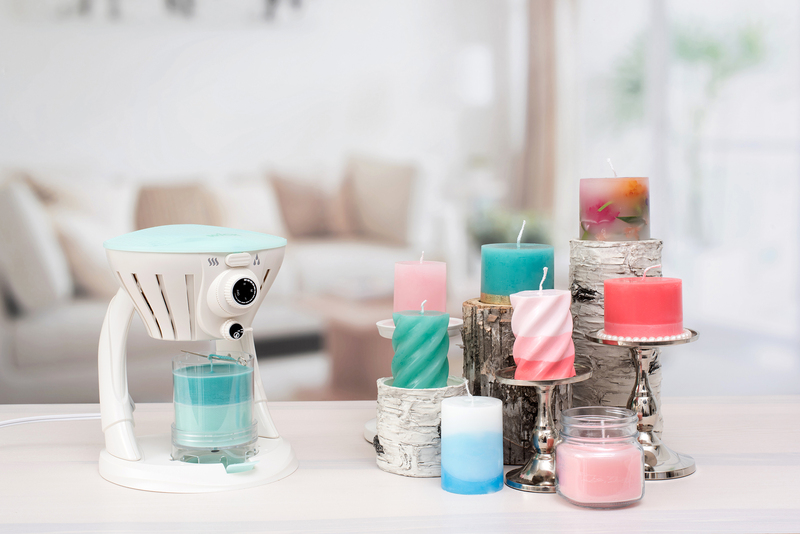 It’s Chantalle with you again and I have to just say, you seriously have to check out the new Wick Candle Maker and the Happy Jig. These two tools are simply out-of-this-world-fun to use and are the focus of the thank you gift I have created, which I can’t wait to show you! I’ve never made a candle before so I was SO excited to see it come out of the mold and two colours no less!! Lol. 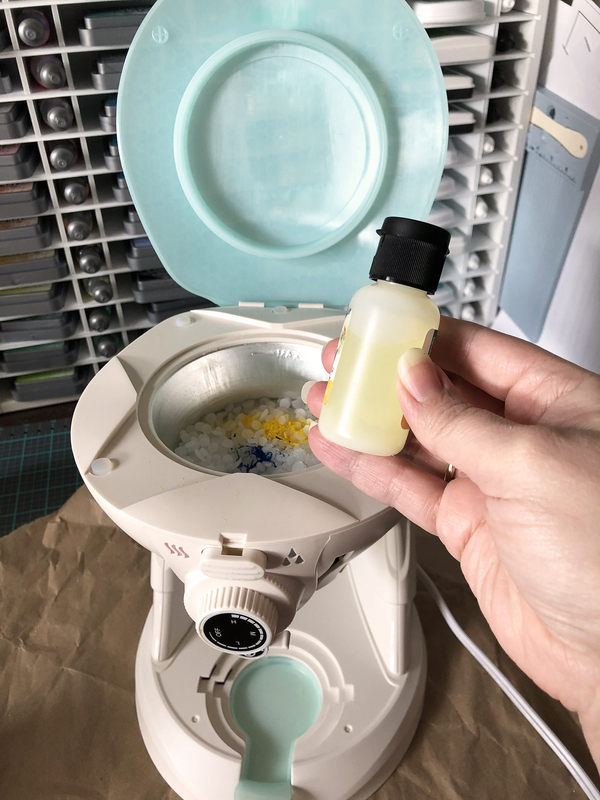 My first instinct was to smell it, kinda expecting it to smell like citrus, so that is my next experiment – infusing the wax! The mason jar serves two purposes: ready-made packaging for my candle and also as a votive for it when lit. 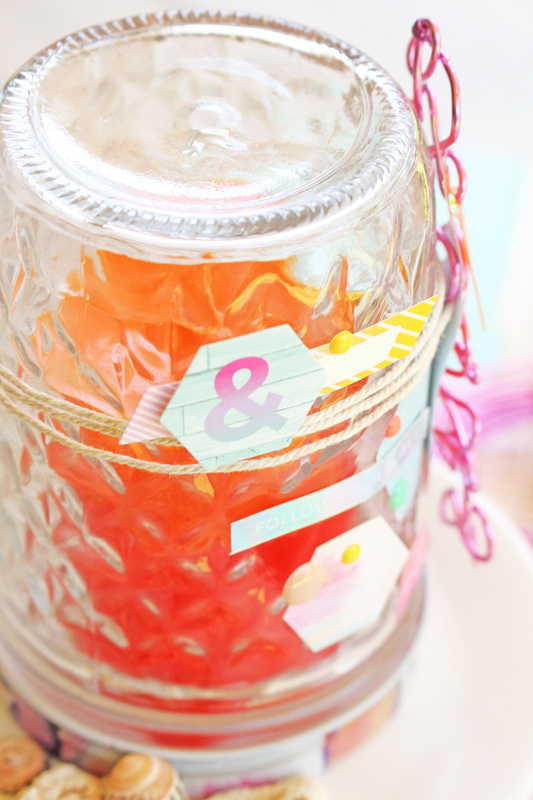 The jar already had an embossed pattern so I’ve kept the embellishments minimal. The word ‘thanks’ can be removed and reused if necessary. It would make a fun bookmark if popped onto some cardstock or could become a title for a scrapbook page! To make my candle, I started off by reading the instructions that came with the Wick machine. 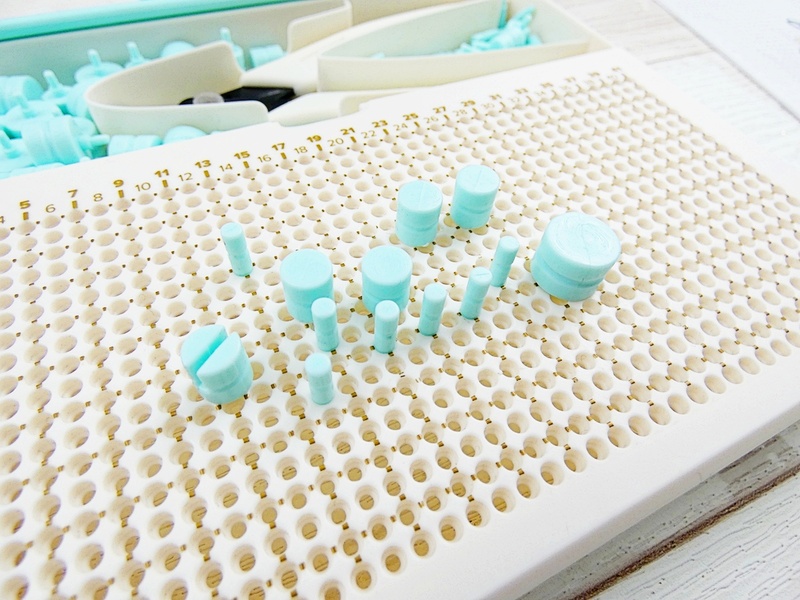 One pops a rubber stopper into the base of your chosen mold, then ties off some wick material onto the metal rod, which balances across the top of the mold. Next, I added some wax material to the receptacle as well as some colouring. I added red and yellow to get orange. There is no precise way to get an exact match, but it is easy to trial and error as you go to create the shade you are after. The wax takes about 20 mins to melt completely, but we still have warmer weather so that time is a guide I guess, depending on temps inside your workspace and how much wax you want to melt etc. Once the wax was totally melted, I opened the little valve and it came running out into the mold. I wanted to create an ombré effect so I filled it up about ¾ and then melted more wax (this time with less red) and then filled the mold some more. It is important to let your wax dry before you add the next layer. I put mine under the aircon to cool, but you could also put it in the fridge. Another thing that happened to me was that the centre of the candle sank in a bit. This is very common and mentioned in the instructions. If this happens to you, simply pop some holes around the wick area before pouring a bit more melted wax into the area to top it up. NOTE: It’s best to let your candle set overnight before removing it from the mold. Another tip would be to cool or heat the mold a bit if you are having trouble removing the candle when it’s set. Here you can see the finished product! I’m thrilled with how it turned out. How awesome it is going to be to be able to make this kind of home made gift for someone you care about! I have placed a bit of melted wax into the lid of the jar and then pushed the candle into it to act like a glue, so it’s doesn’t move around too much inside the jar. 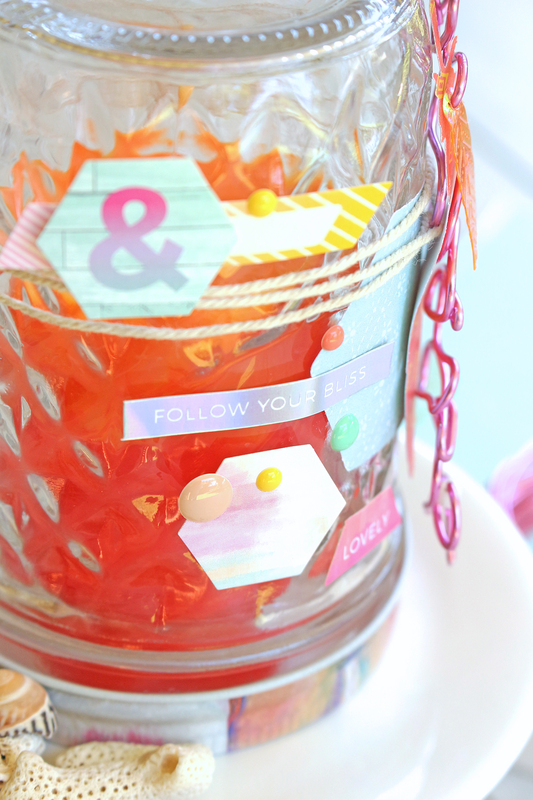 The jar itself has been embellished with some Pink Paislee Summer Lights Cardstock Stickers. These stickers are awesome as they have some holographic foil elements! I mimicked the smaller hexagonal shapes with my Hexagon Clear Cut Punch. The one bigger size helps create balance. To create the word ‘Thanks’ I grabbed my Happy Jig and set up the guides, ready for the wire. Overall, the word turned out OK. It’s easy to get a couple of areas that don’t look perfect (a bit of stretching can occur when pulling off the Happy Jig guides) I just us my little pairs of pliers that came with my Cinch Binding Tool and tweaked the word here and there. To add a bit of extra sparkle to my jar, I have threaded some little beads onto the wire. 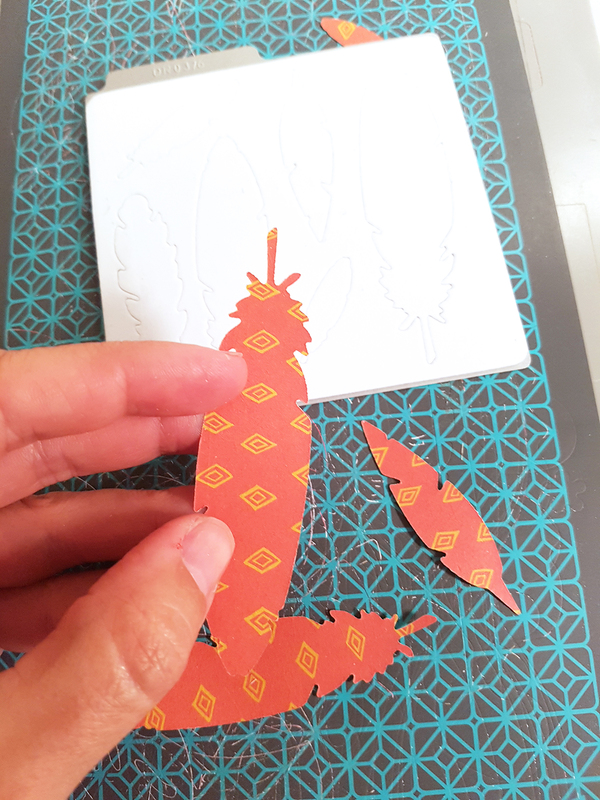 I’ve also added a plastic die cut feather as well as a paper feather die cut shape. These feather shapes have been cut using my Evolution Advanced along with my magnetic mat. I snipped a tiny hole into the top of the paper feather, which made it a lot easier to add to the wire word. The Happy Jig is such a fun tool to own. 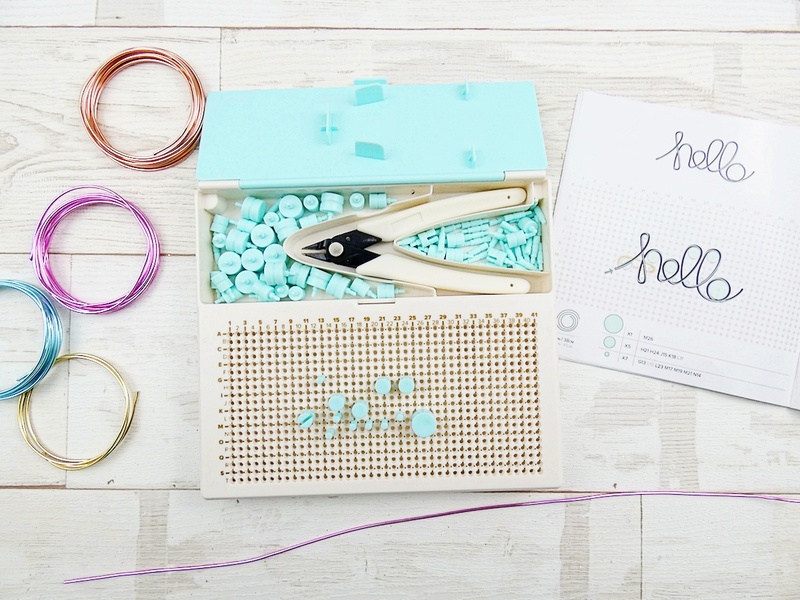 The instructional booklet is full of ideas and easy-to-follow instructions to create both shapes and paperclip options. I hope you enjoyed this post. 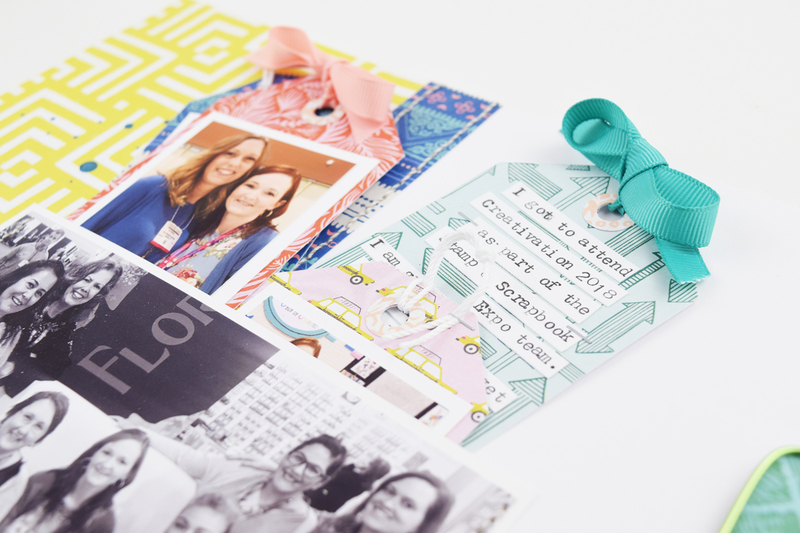 Be sure to tag @wermemorykeepers in your social media posts so we can enjoy seeing you get your craft on! Thank you so much for stopping by. Happy gifting! 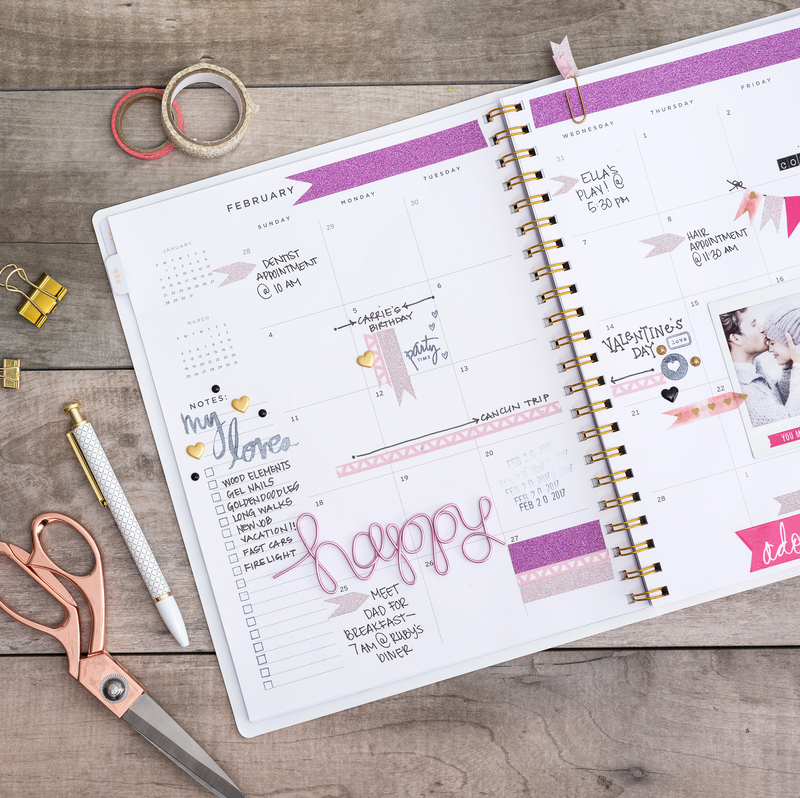 Hey there We R Memory Keepers friends and fans, Becki here to share with you a layout that I created with the Happy Jig. My kids and I have had so much fun playing with this new tool. Yes, it’s easy enough for kids to play with. 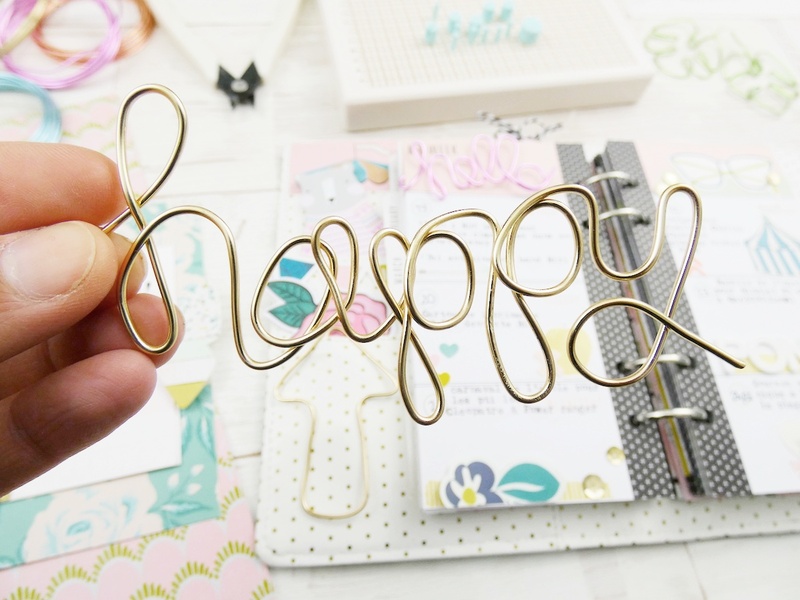 The Happy Jig makes awesome unique embellishments for scrapbooking. 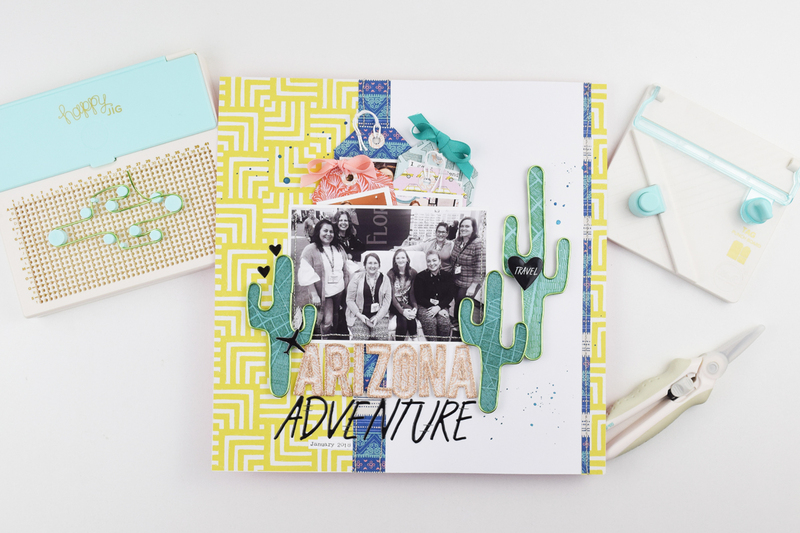 I chose to create a layout with three adorable green wire cacti to document my recent trip to Arizona. 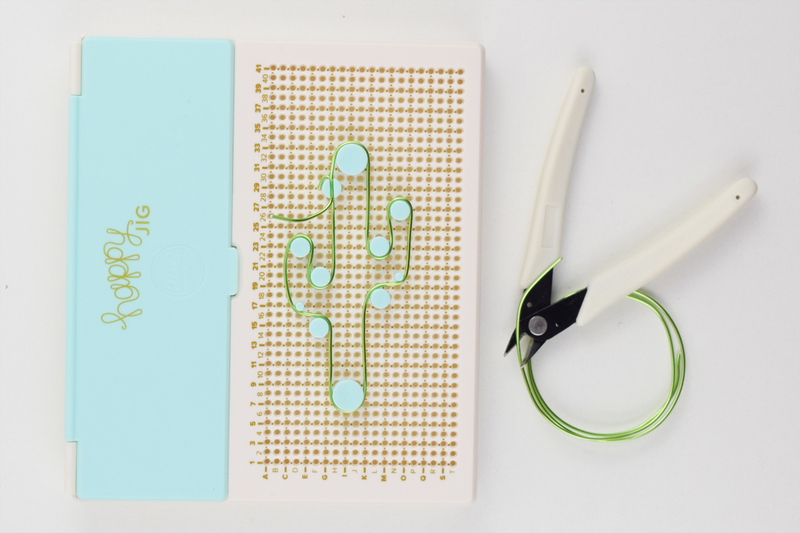 It was so easy to create these three cacti with green wire and a little bit of patterned paper. I started by creating three cacti according to the directions in the instruction booklet. After I had the wire outlines created, I added patterned paper behind each wire shape. 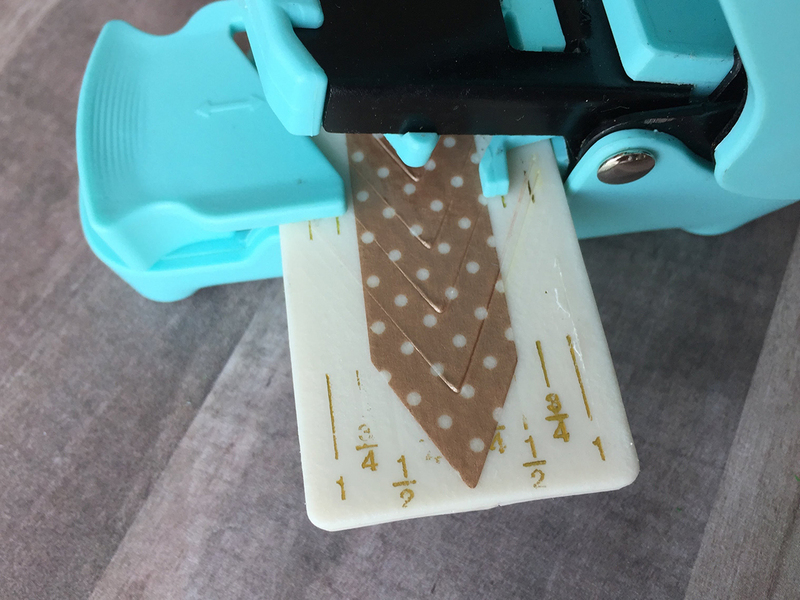 To add the patterned paper, I used a strong craft glue to adhere the wire to the paper. I waited until after the glue was dry before I trimmed around the cacti. 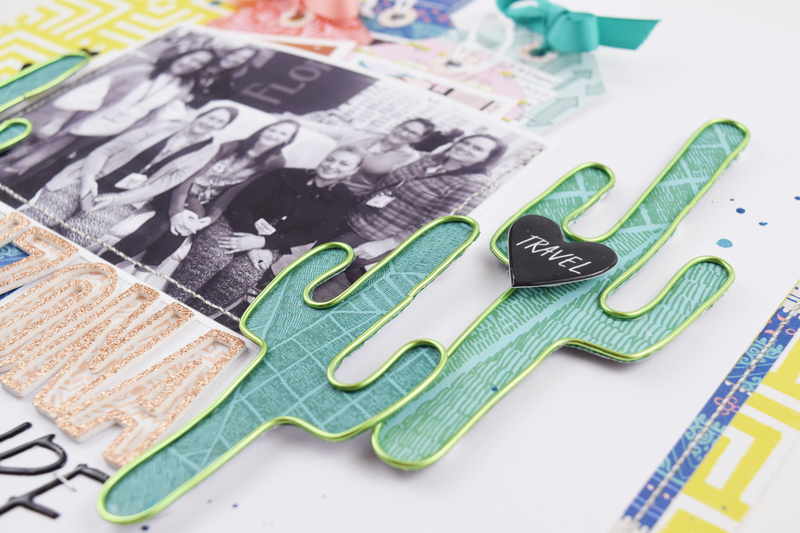 Of course, I used my favorite new Crafter Essential Details Scissors to trim around the edges of the cacti. They worked perfectly. When it was time to add these wire embellishments to the layout I used dimensional adhesive. 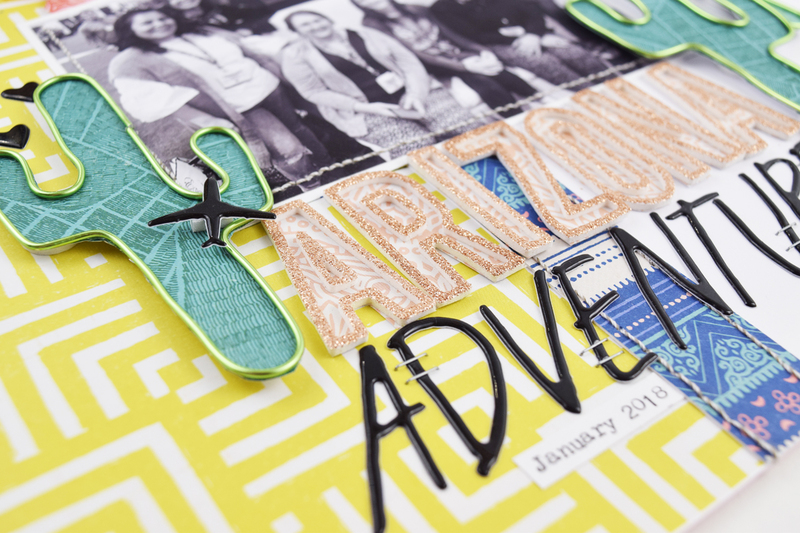 I wanted these awesome embellishments to pop off of the page. I used a few more We R Memory Keeper tools to complete this layout. The main photo on this layout is stitched in place on three sides to create a pocket. 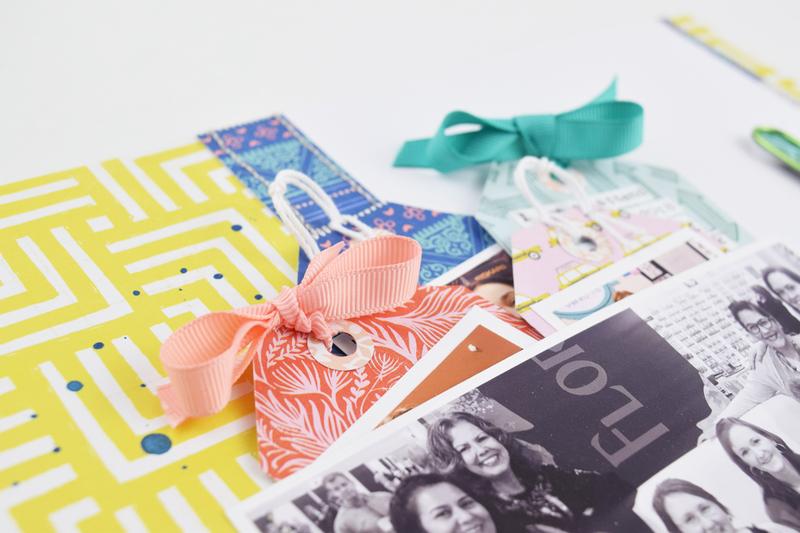 Then I created a few tags with the Tag Punch board to add a few more photos and journaling. I always reach for my Typecast Typewriter when it’s time to add journaling. I love adding typewritten journaling to my layouts. 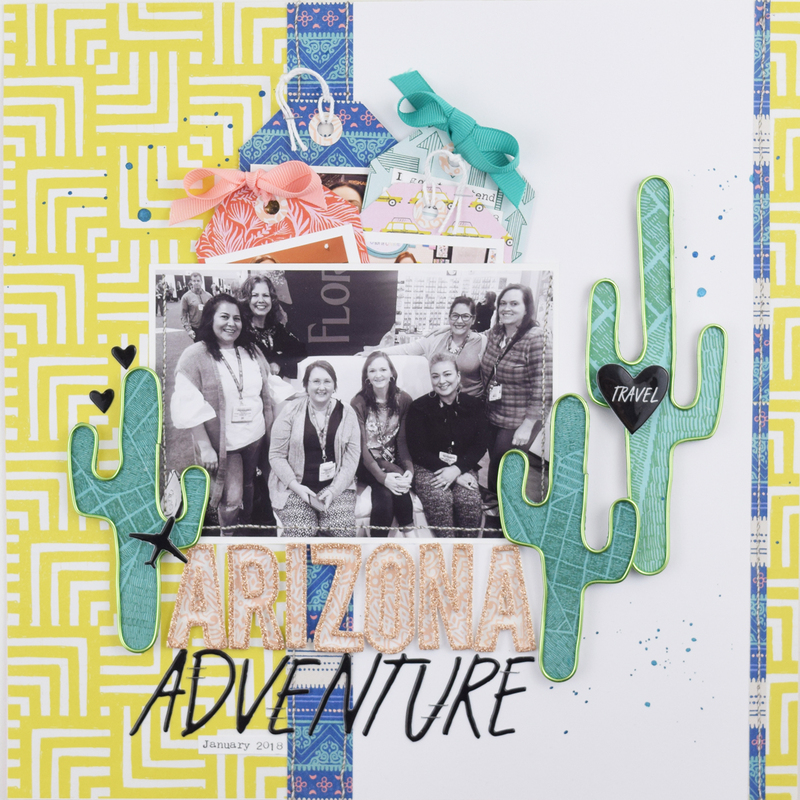 This layout was so fun and so easy to create with a few of my favorite tools from We R Memory Keepers. I can’t wait to see what you create with the Happy Jig. 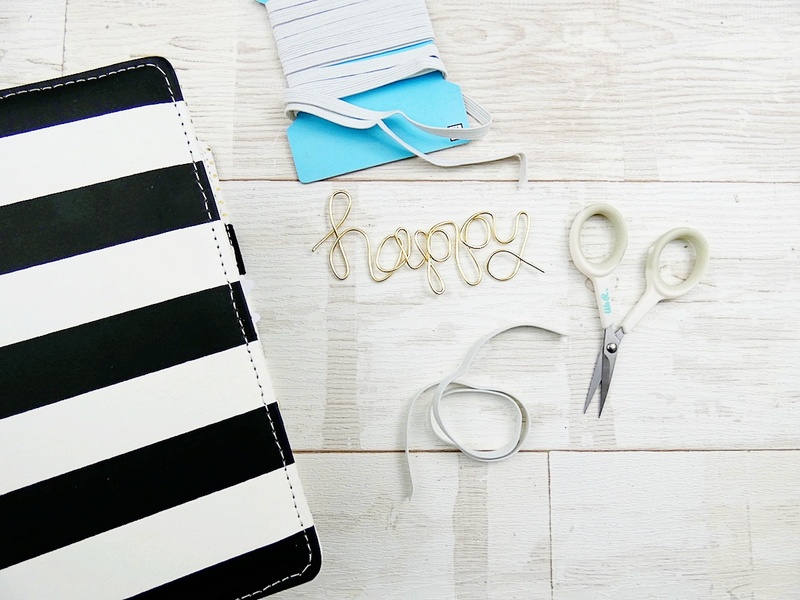 Happy crafting my friends! I’ll see you soon. 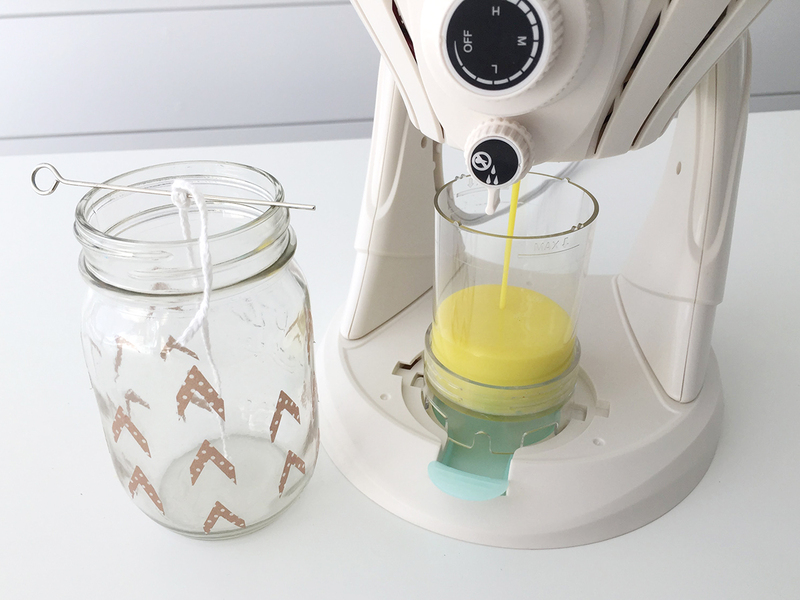 We hope you’ve enjoyed Candle Making Week here on the blog, and that you’ve found some helpful inspiration for your own projects. 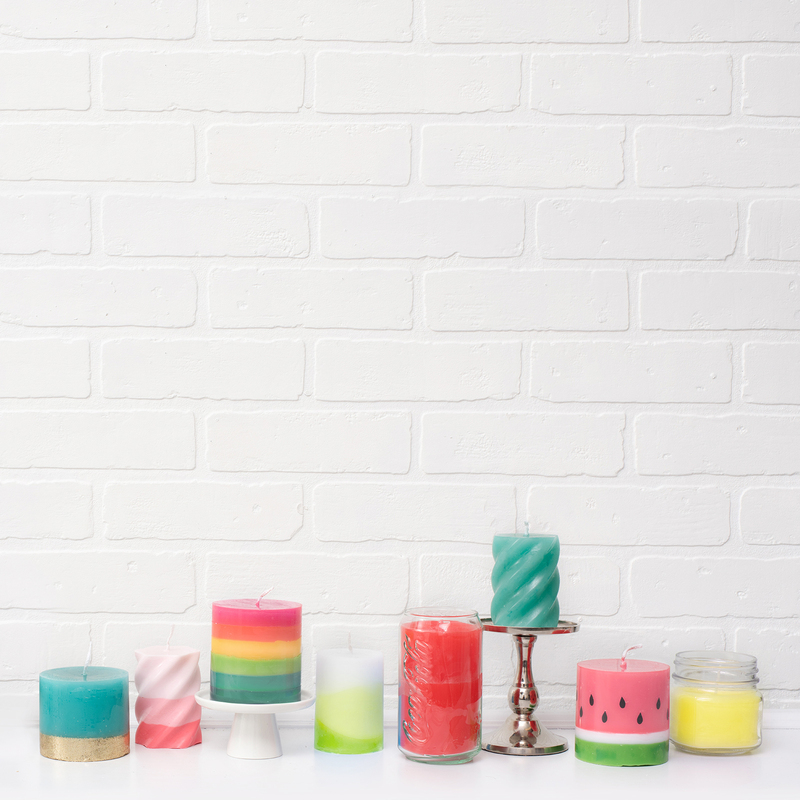 To close out the week we’re sharing a roundup of some candles that our in house designers made with the Wick Candle Making Kit. Sit back, relax, and enjoy the eye candy! 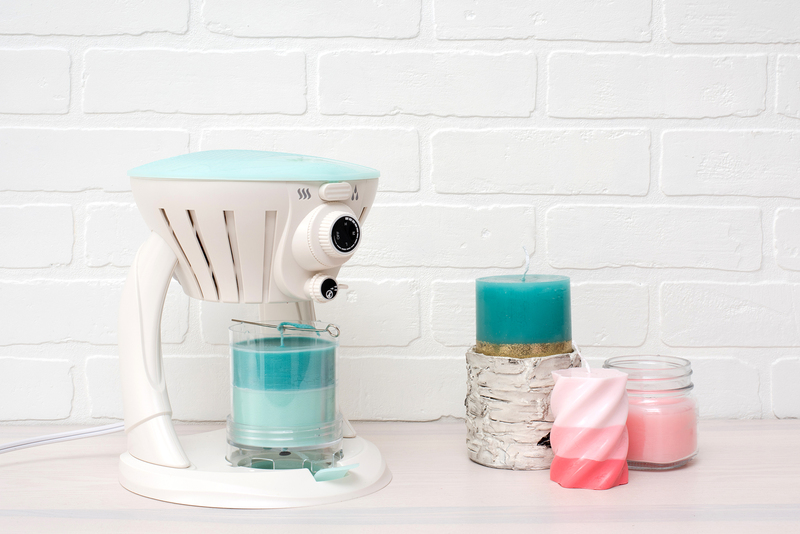 Candle making is easy and safe with this awesome new tool. 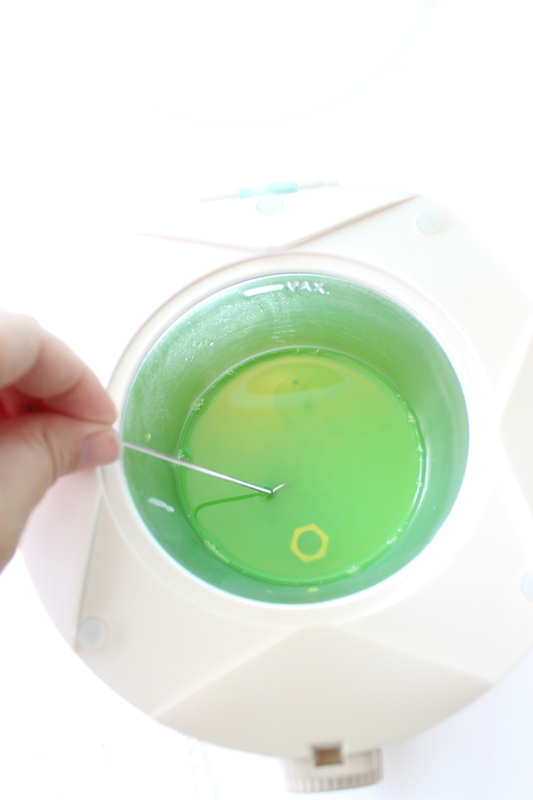 Simply add the parrafin wax chips included in the kit into the heating chamber to melt them. Customize the color of your candles with the included pigment flakes and convenient color chart. 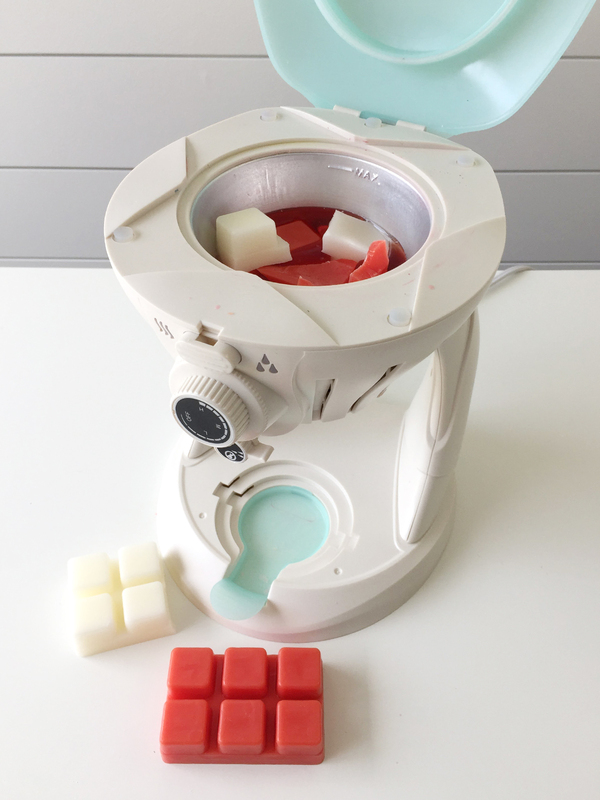 Using the three included molds, you can make small, large, and spiral candles by turning the valve to allow the melted wax to pour into the mold. 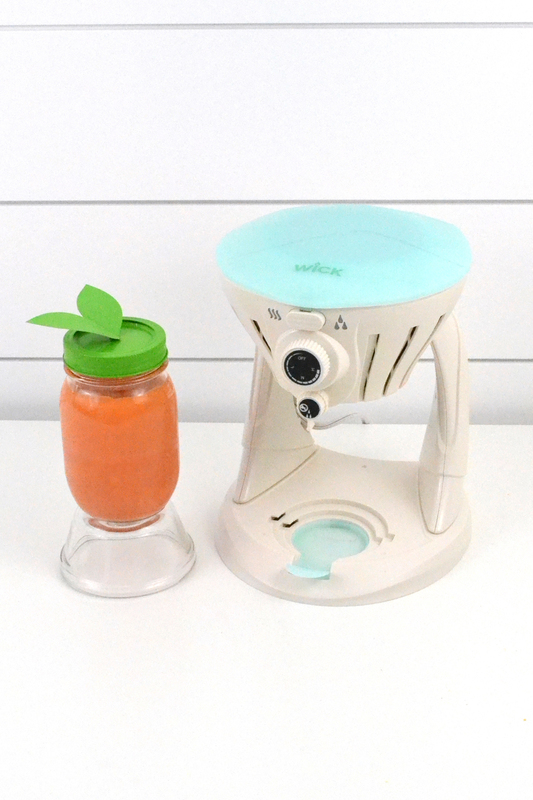 No mess, no burns, and no fuss! 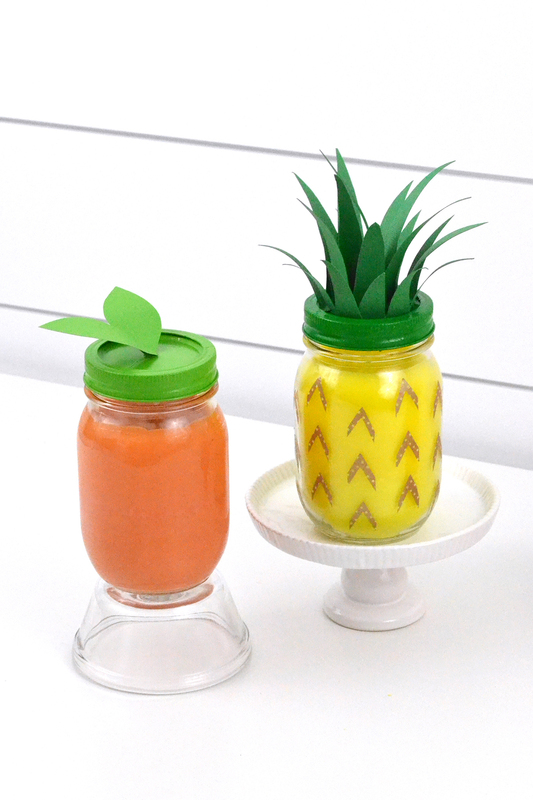 You can embellish the candles themselves, or get creative and make them in unique containers that you can decorate as well. What ideas do you have for candle making with the Wick? Hello We R friends! It’s Aly here again, and I’m excited to share some candles I made as a gift for some dear friends of mine with my new Wick Candle Maker. 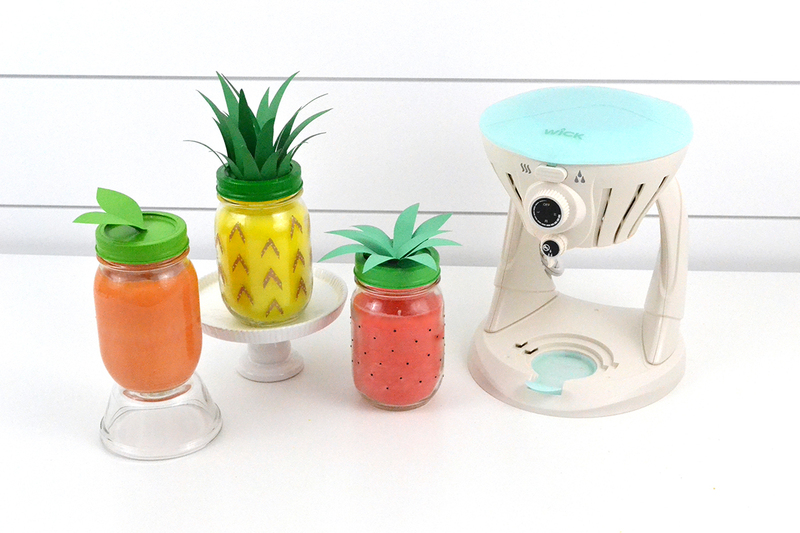 I grabbed some old dollar mason jars I had in my stash and turned them into Tropical Fruit Scented Candles: a pineapple, a strawberry, and a peach. Since I got my Wick Candle Making Kit, my girls and I have starting making gifts for friends and it’s been so much fun! The Wick is simple and safe enough that I feel totally comfortable including young crafters in the process, which I love. 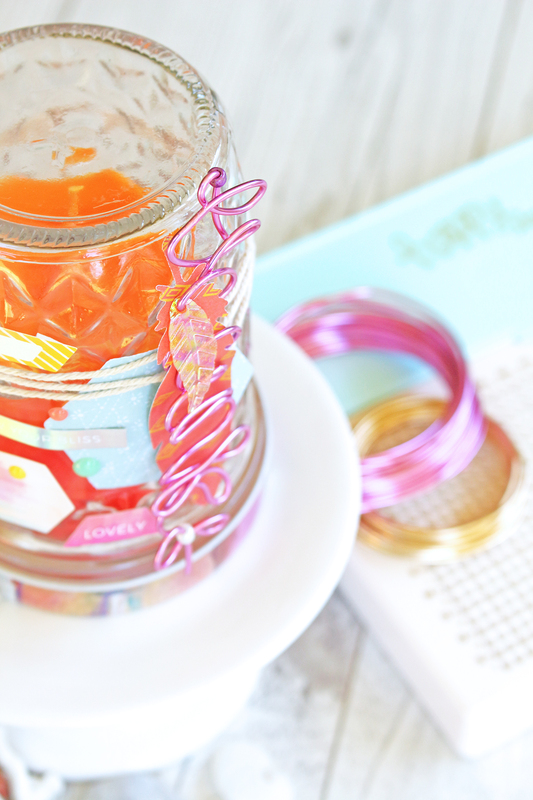 My mason jars are pint size (16 oz) and don’t fit under the Wick machine, but that’s no problem! You can totally use larger containers with your Wick. All I had to do was fill the small mold to the max line twice and that filled the inside of the jars perfectly. Tip: measure with water ahead of time to see how many molds fit into your container. After filling the heating chamber to the max line with the included wax pellets, I measured out the pigment powder so I used the same ratio for both pours into the mold. That way the colors match exactly. I set the heat on high, and waited about 20 minutes for the wax to melt. 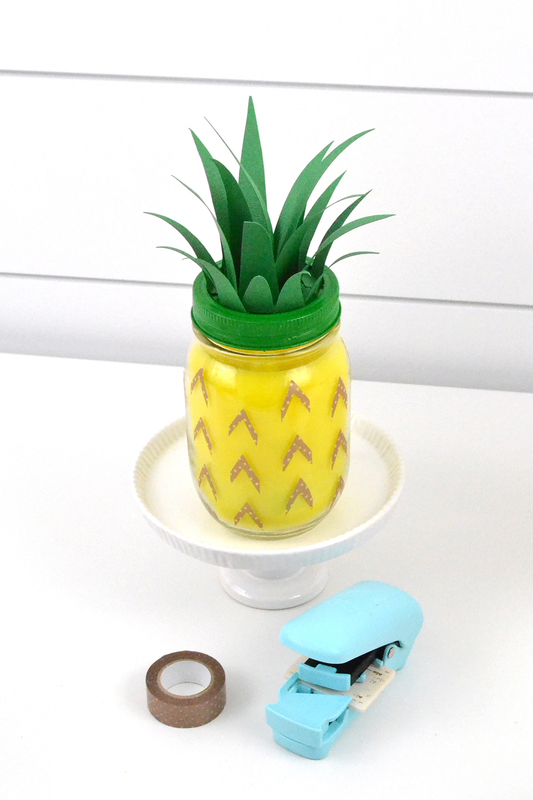 While waiting, I decorated the outside of my pineapple jar with washi tape that I cut into thin chevron shapes with my Washi Chomper. For the strawberry jar, I added black dots from leftover punctuation and letter stickers. Then I added the wick to my jars using the tip from Kimberly in THIS POST. 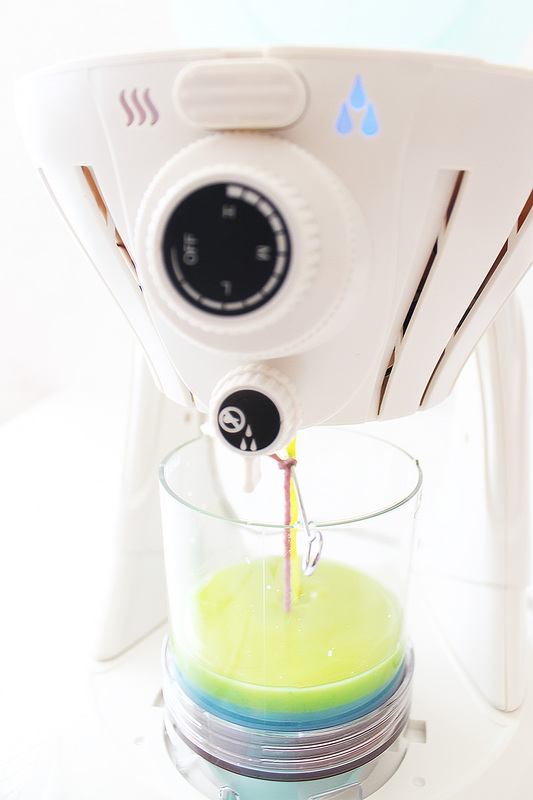 Once the wax melted I added 3-4 drops of fruit scented frangrance oil and stirred the melted wax thoroughly. Then I opened the valve and allowed the wax to pour into the mold. While it was still hot, I carefully poured it into my jar and then started on the next batch of wax, following the above steps. I recommend wiping out the mold with paper towels after the first pour while the wax is still melted. It’s much easier to clean the mold that way. 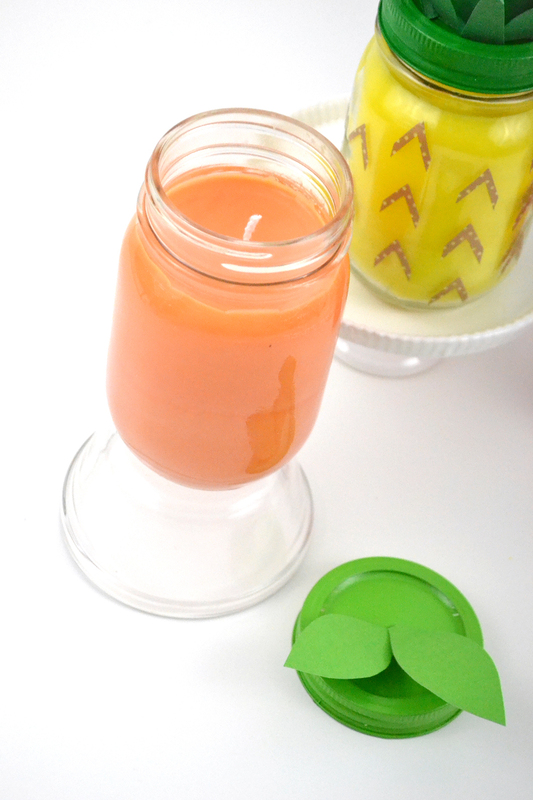 Tip: wax shrinks slightly when it cools, so you will notice the center of your candle caves in slightly. 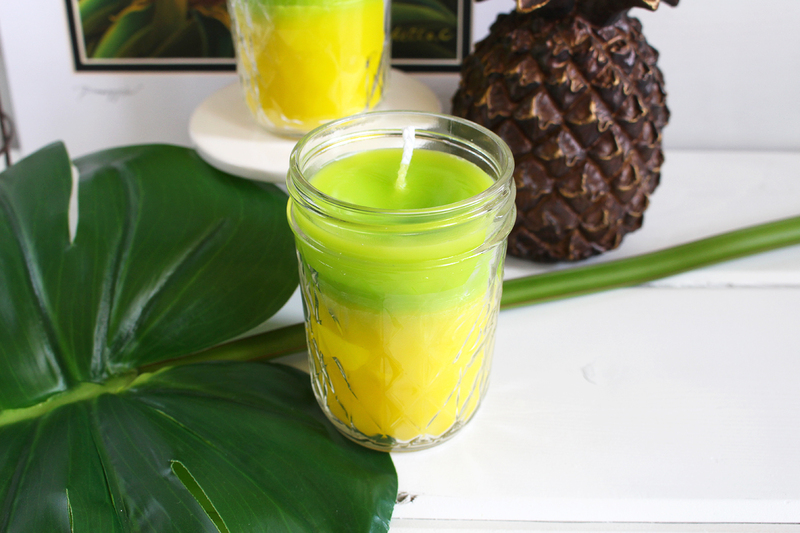 Hold back some wax so you can top off your candle once the second batch dries and fill it in. While the second batch of wax cooled, I decorated the jar lids. I started by painting them green. I used three different greens to add a little interest to the set. 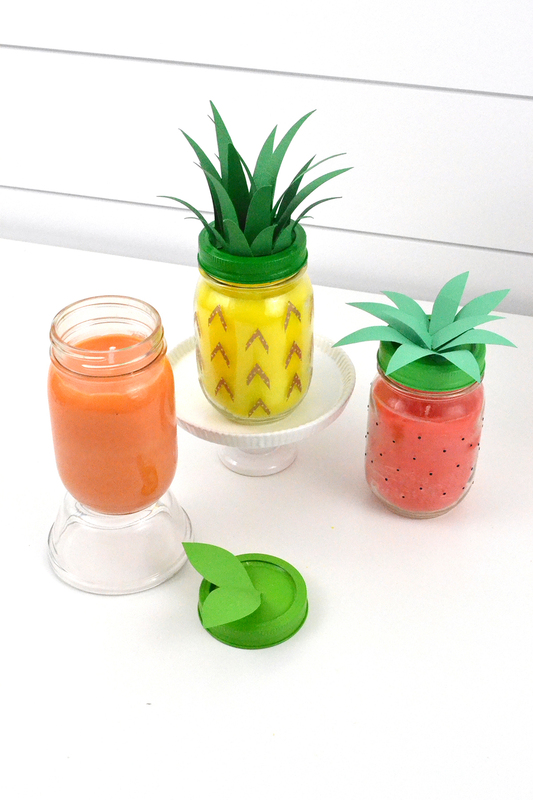 While the paint dried, I cut out leaves for the pineapple, strawberry, and peach candles. Once the paint dried completely, I hot glued the two parts of the lid together, and then hot glued the leaves on each lid with the USB Mini Glue Gun. For the peach candle I wanted to try using scented wax melts from my local craft store. I found some peach scented ones but the color was darker than I wanted, so I mixed in some French vanilla melts along with a little yellow pigment from my Wick kit. I love how it turned out! Be sure to clean out the heating chamber in between candles. I found it easiest to turn the heat down to low once I finished a candle, and then wipe out the heating chamber with paper towels. That way the wax is still melted and easy to wipe, but the chamber isn’t so hot. I’d love to try some soy wax, bees wax, and adding dried flowers or pot pourri to my next set of candles. It’s so much fun, and there are so many possibilities! This is a great project for a gift, for spring or summer events, or for home decor. Thanks for stopping by–I’ll see you next time! Hello We R Fans! Kimberly here today. 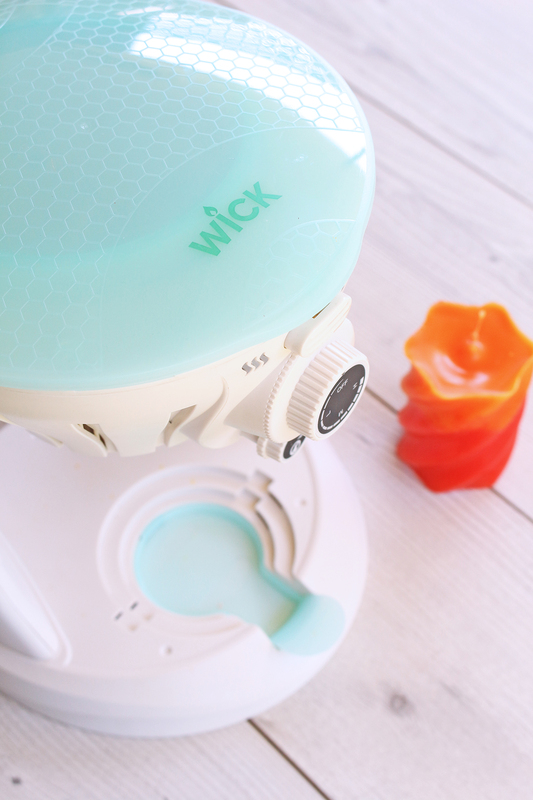 The Wick candle machine is one cool new tool! But, then again, We R Memory Keepers always knocks it out of the park with its tools! Honestly, I was not sure about making candles. I am crafty, but more paper-crafty, than crafty-crafty. That has changed. I am hooked! 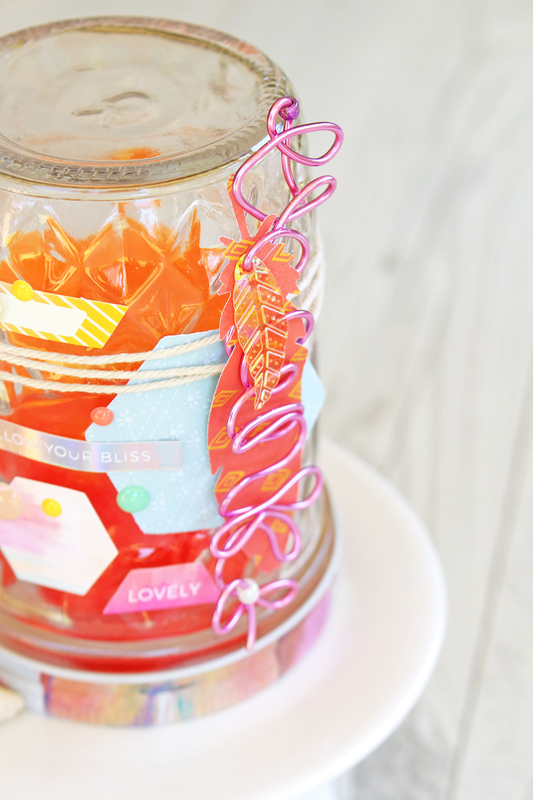 The Wick is easy to use, easy to clean, and both of those things add up to pure crafting fun! 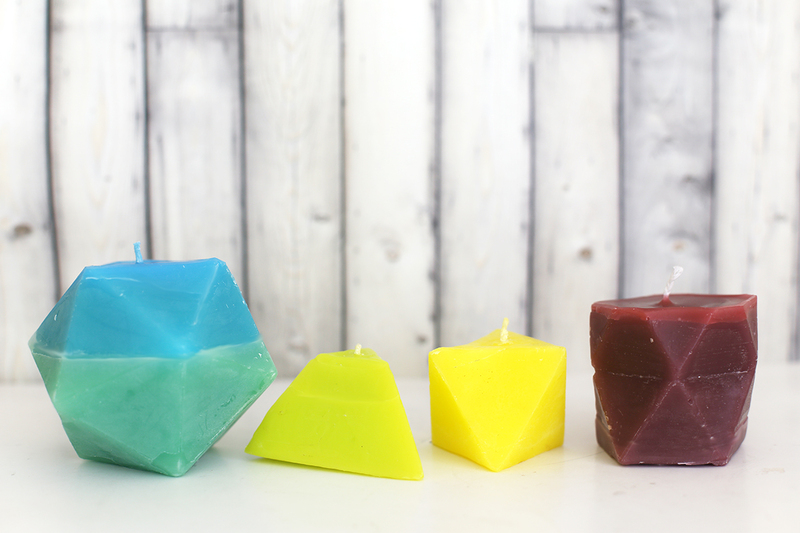 The Wick allows you to make pillar candles using molds. Three different molds come with the Wick, which is cool. But I had a crazy idea to try out. 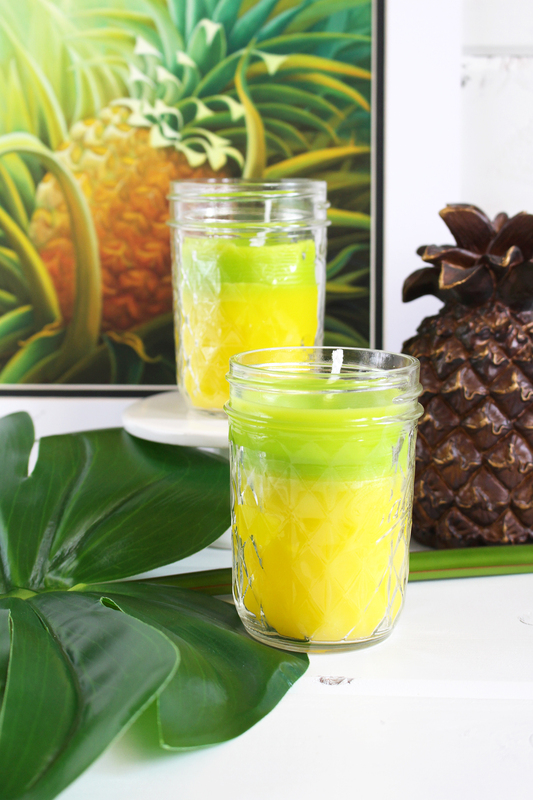 I wanted to use small jars and create candles that look like pineapples. I am obsessed with pineapples and our guest bedroom is getting a redesign. Perfect time to make my own décor to match my theme. 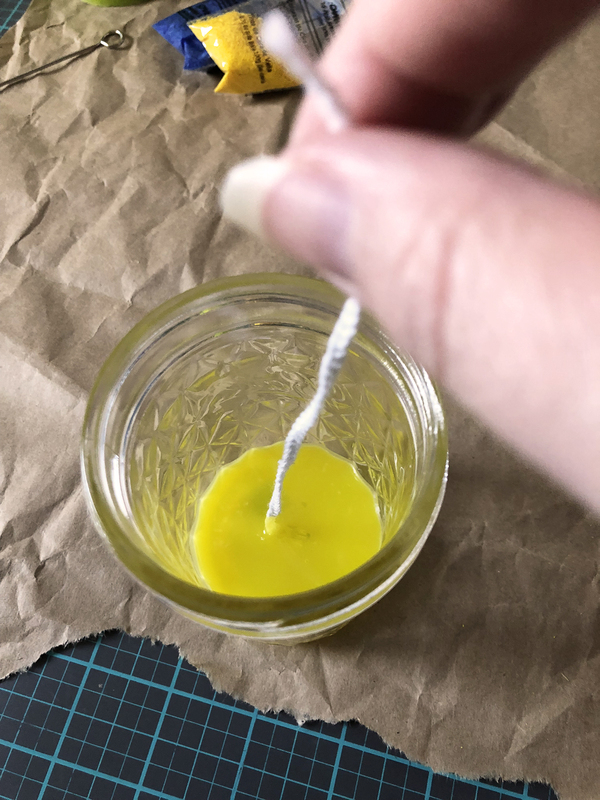 I already had my wax and color melted in the Wick, so, carefully holding the cotton wick string, I opened the pour valve slightly and let a few drops of wax come out to cover the bottom of the jar. By doing this, I could help set the wick in place. 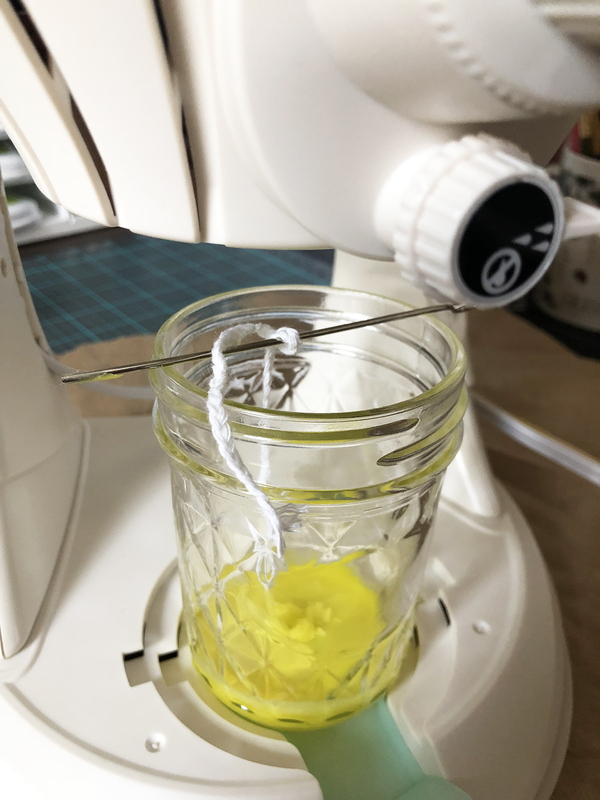 I allowed the wax to cool for a few minutes and then tied my cotton wick string around the metal stick to keep it in the center. 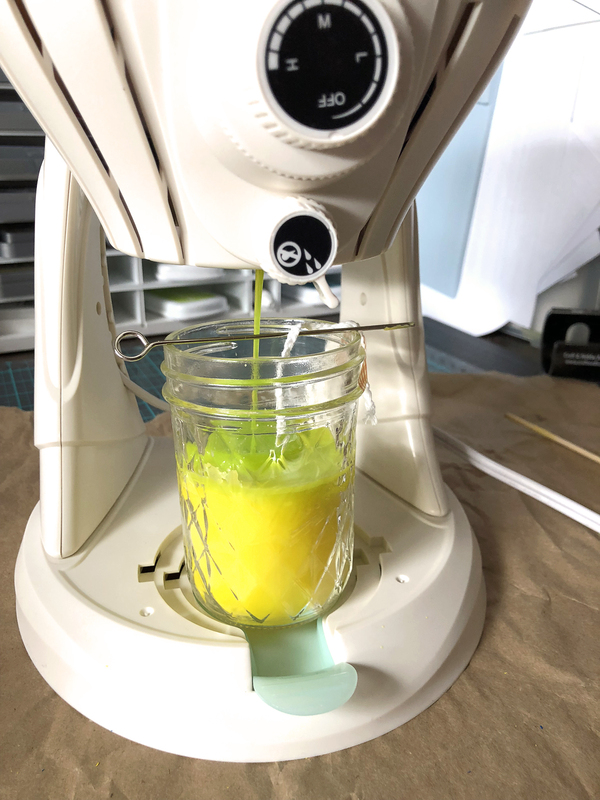 I finished pouring the rest of the wax on top and created the bottom layer of my “pineapple.” I set it aside to cool completely before adding the next layer of green. 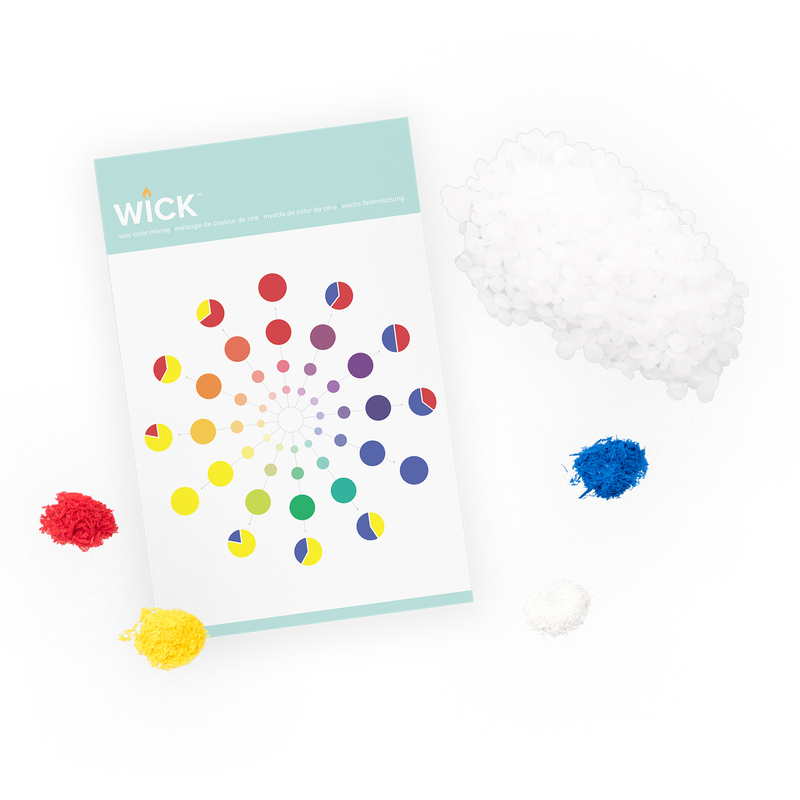 The Wick comes with packets of dye flakes to change the color of the wax. Because I wanted green, I used yellow and blue. There is a handy color chart included with the Wick to help you determine how much of the coloring to add. A small amount of flakes are needed for vivid colors. 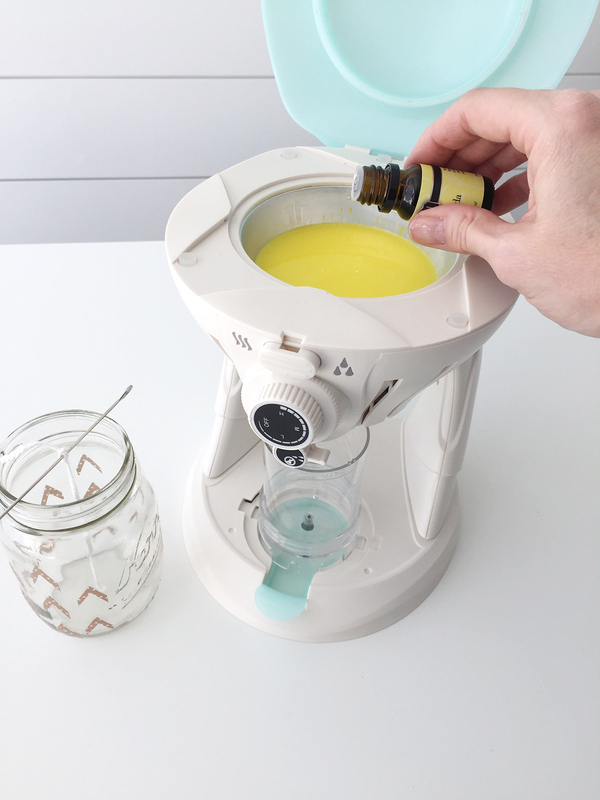 Another cool thing you can add to your wax are oils. You can add scents! After searching online, I found pineapple essential oil. Yes, I did! 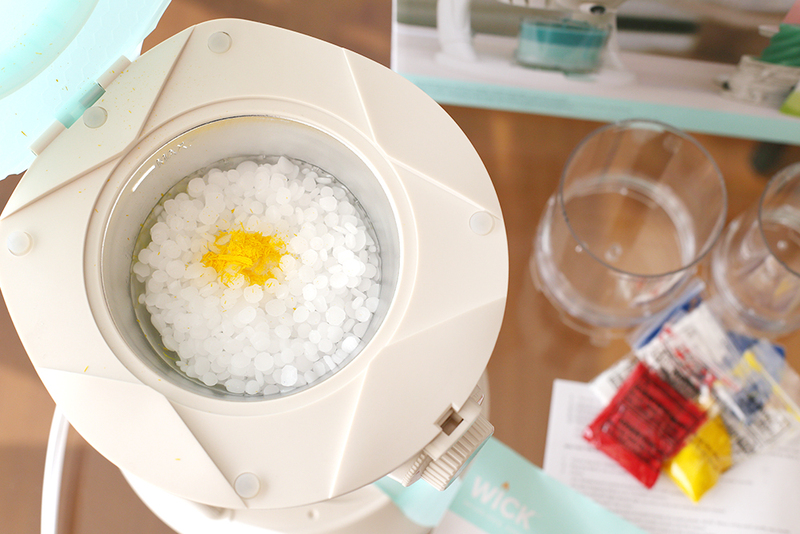 Add a few drops to your wax once it is melted and enjoy custom scents! 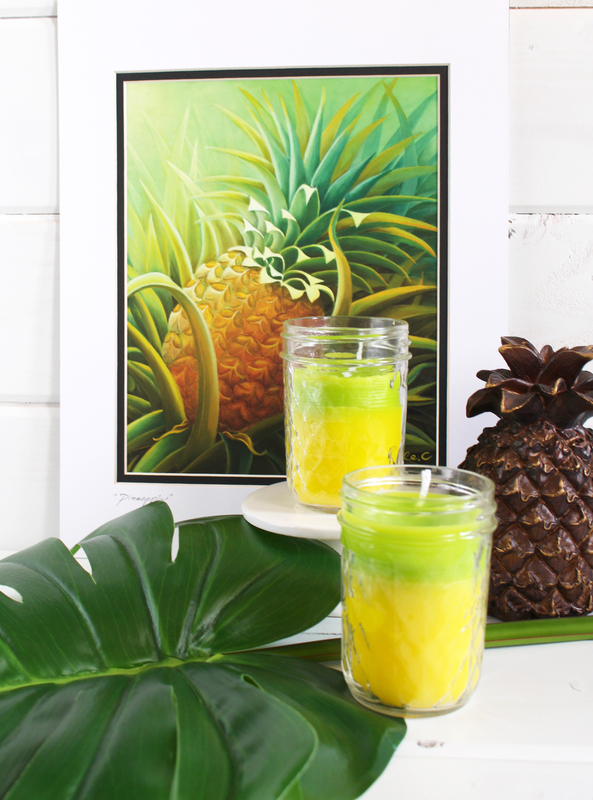 How fun are these “pineapple” candles? I cannot wait to try more styles, colors, and scents! What color candle would you make first? Hello everyone! 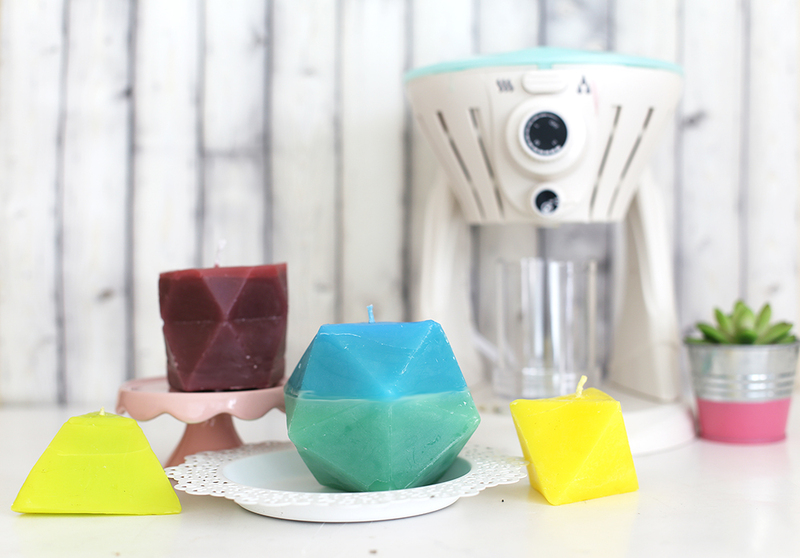 It’s Eva here today bringing you a tutorial on how to make geometric candles using the Wick Candle Maker and the Triangle Score Guide. 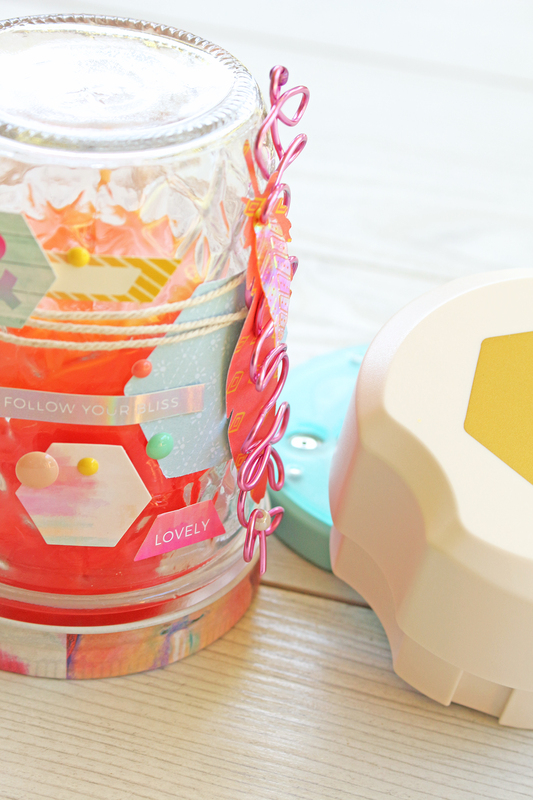 As soon as I received the Wick Candle MakerI knew what kind of candle I wanted to create! 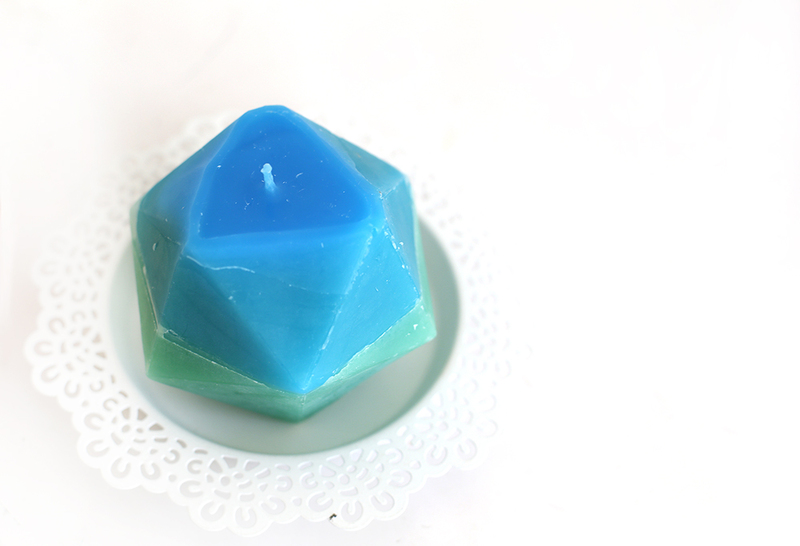 I love geometric shapes and I thought it would be fun to use the Triangle Score Guide to make molds for my candles. This was my first time making candles and it was very fun and easy! 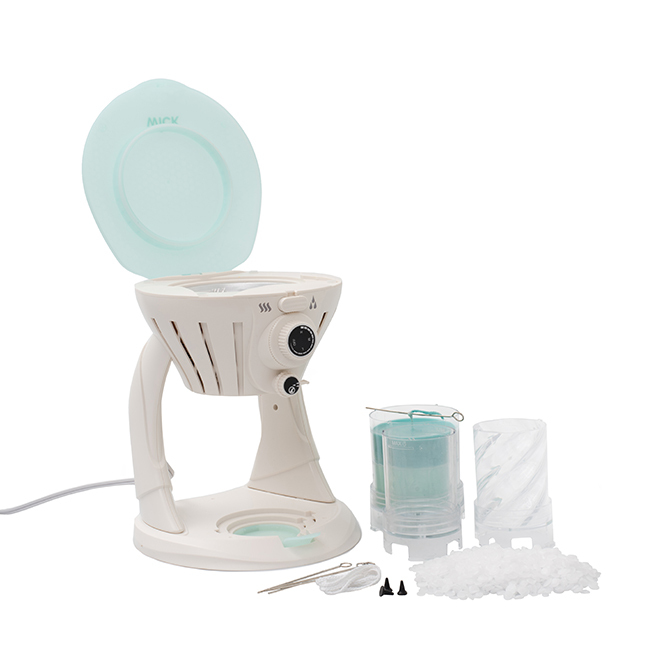 The Wick Candle Maker kit has everything you need to make candles: paraffin wax, cotton wicks, pigment powder and 3 candle molds with a removable bottom so the candles are easy to remove. 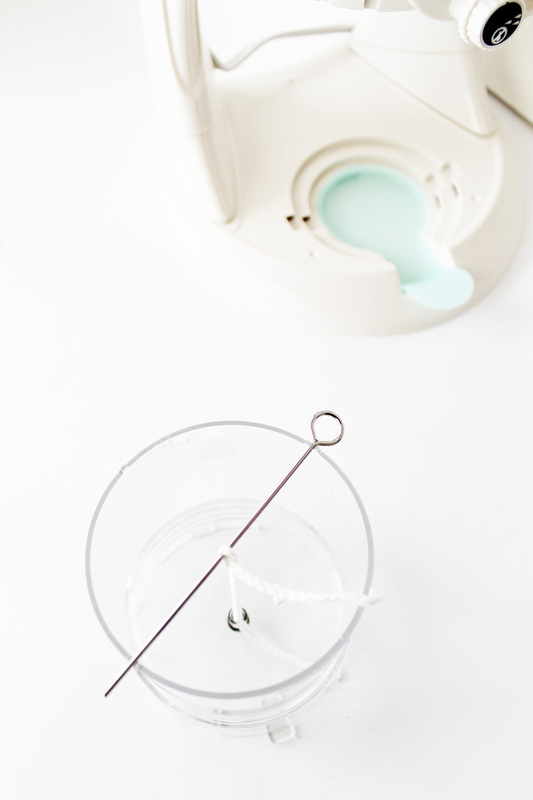 To begin simply place the paraffin wax in the Wick Candle Maker. Add pigment powder and scent and turn it on. 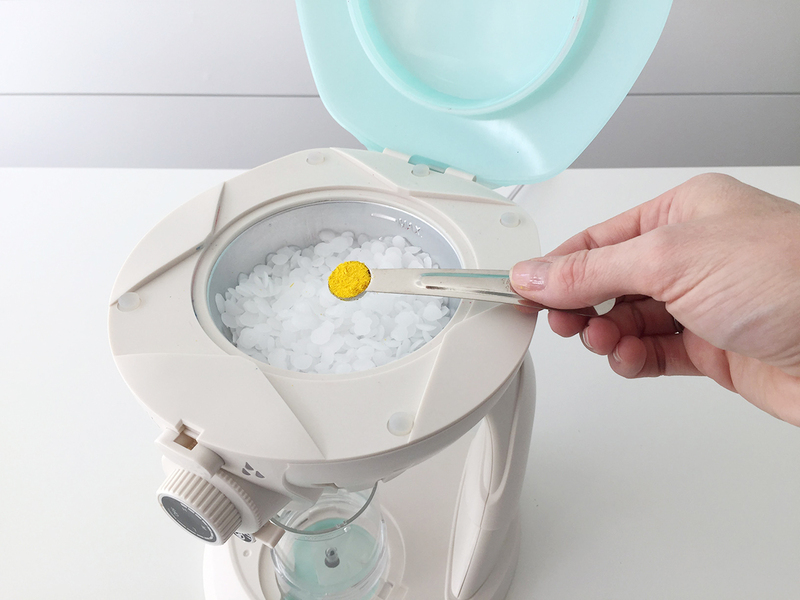 It takes 10-15 minutes for the paraffin to melt. Once it is done simply use a skewer to mix everything. 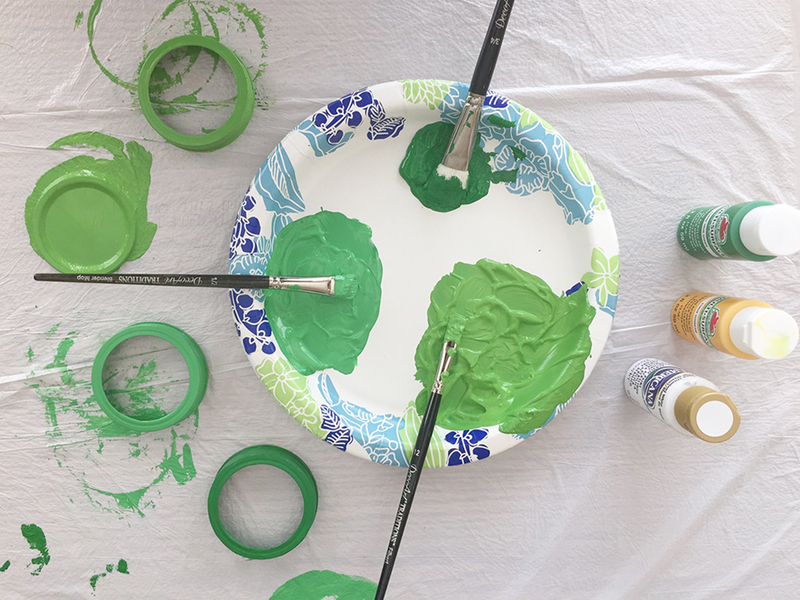 Tip: Start with your lighter colors first, that way if you have some spare wax you can add another pigment and create another color. 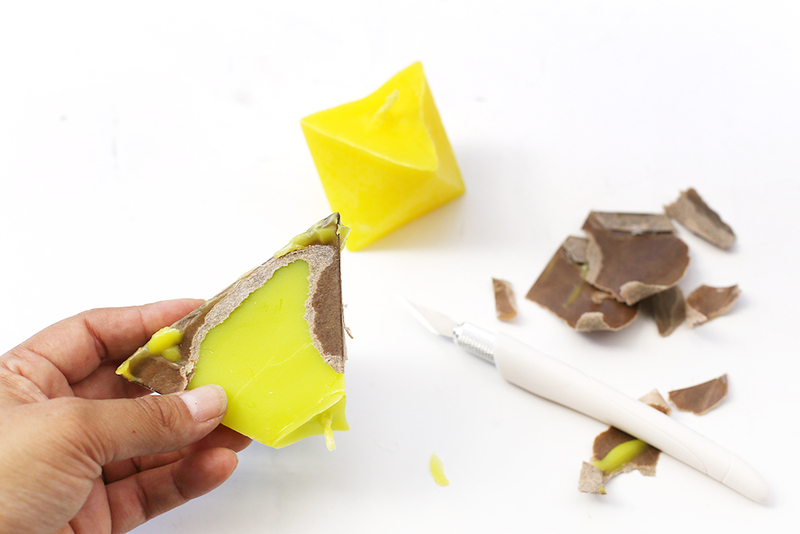 Use your Triangle Score Guide and your Trim and Score Board to create your geometric paper molds. 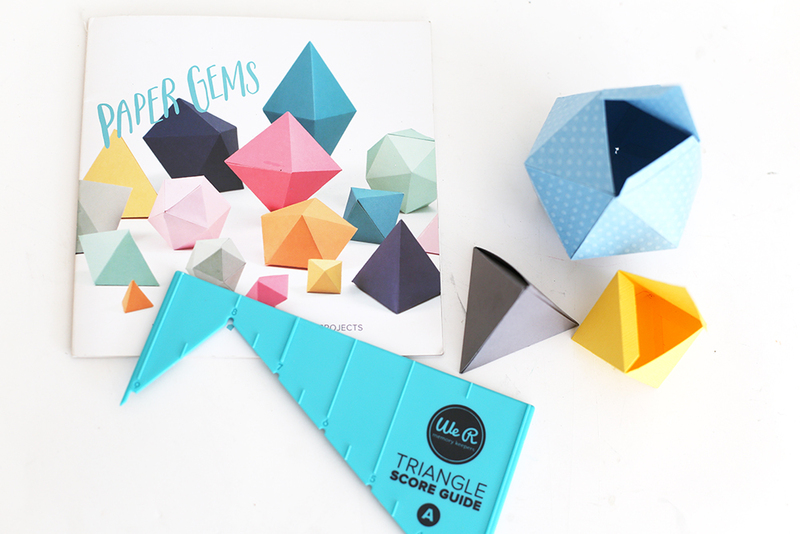 The triangle Score Guide comes with a booklet with instructions for several shapes. I decided to make a pyramid, an octahedron, a tetrahedron, and a tube shape like one I did for this Geometric planter years ago. 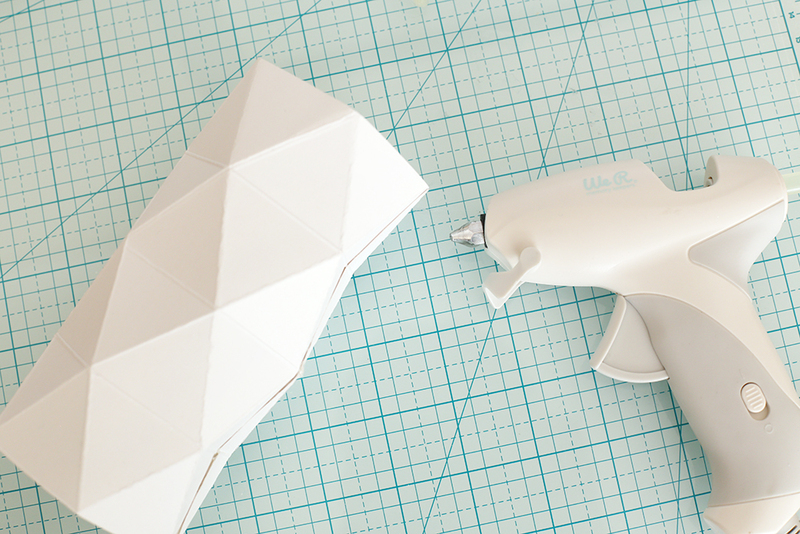 I used my Crafter’s Essential USB Glue Gun to create my geometric shapes and added extra glue to all the creases. You could also add a coat of paint or a sealant to prevent leaking. To fill the candle simply open the valve. I suggest you add a small amount of melted wax and see if you have any leaks. A small leak can be solved by putting the candle in the fridge. The wax will cool and will seal the leak. Remove your candle from the Wick and let it cool until it is completely room temperature. Because wax shrinks when it is cold your candle will probably cave in in the center and you will need to add a small amount of wax at the end to even the candle. What I did was pour a small amount of wax into a baby jar and when my candle was dry I heated the jar on a pot with water and added the melted wax. 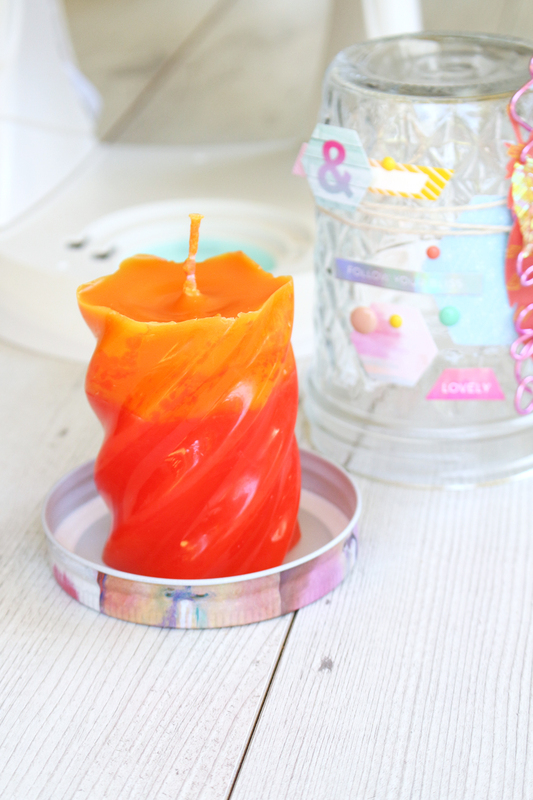 It is important to keep the same candle mix because it is very hard to recreate the same candle color! 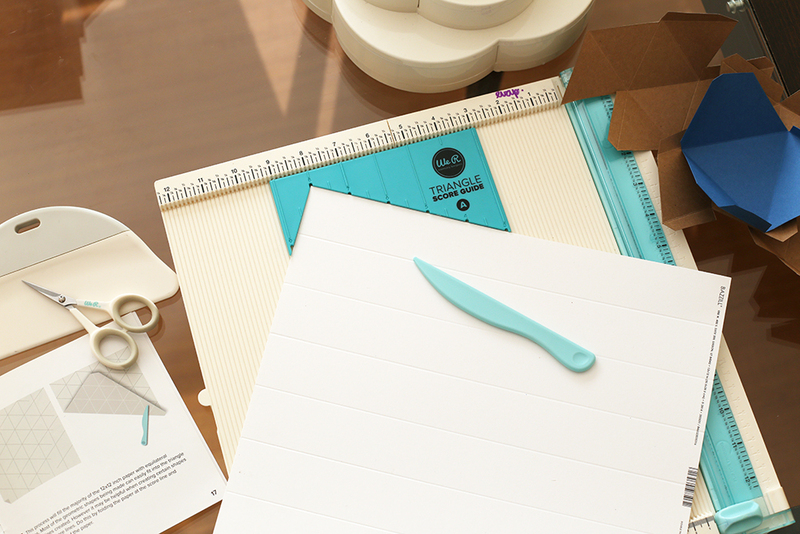 Finally, once your candles are dry, tear off the paper and use your Crafter’s knife to clean up the edges. 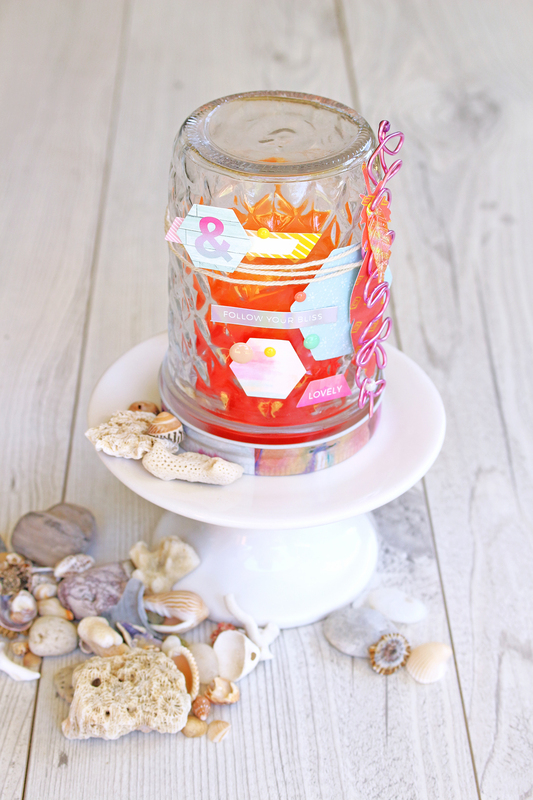 Add different color layers to make your candles different! 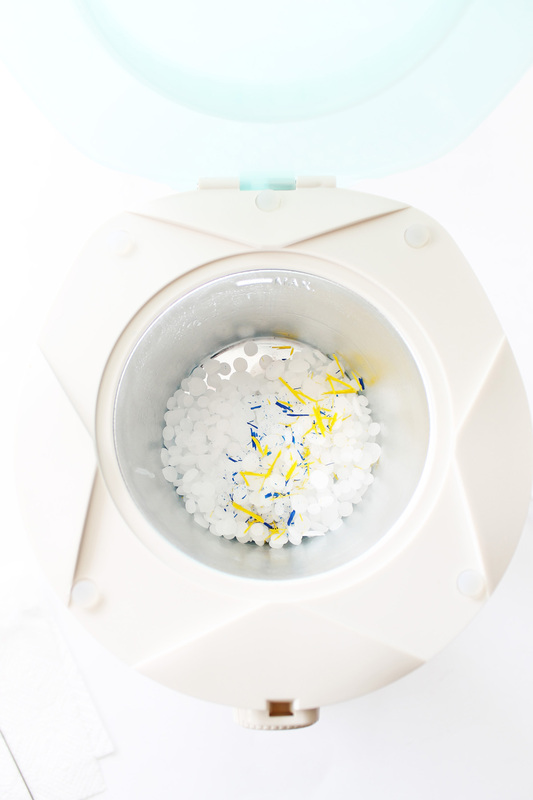 You can make ombre candles, rainbow candles and even add glitter or dried flowers to your mix! And here are my final candles! This was my first time making candles and it was a lot of fun! 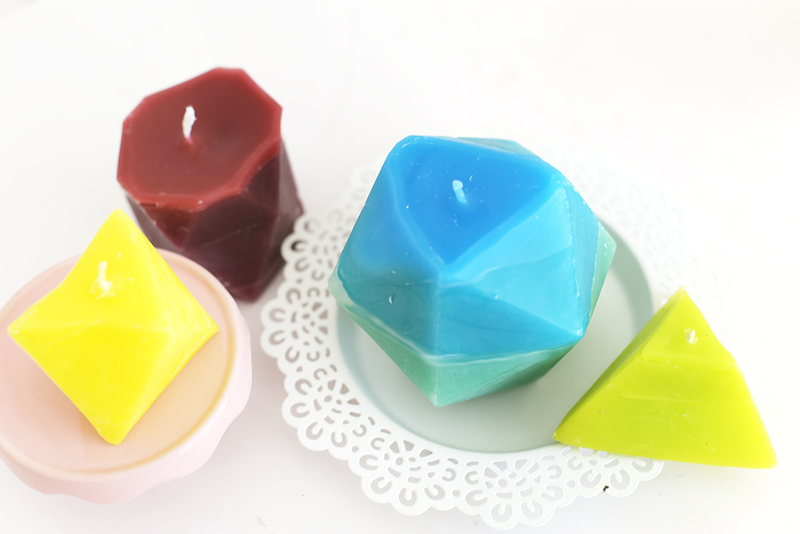 The geometric molds worked out great and I love the vibrant pigment colors of my candles! 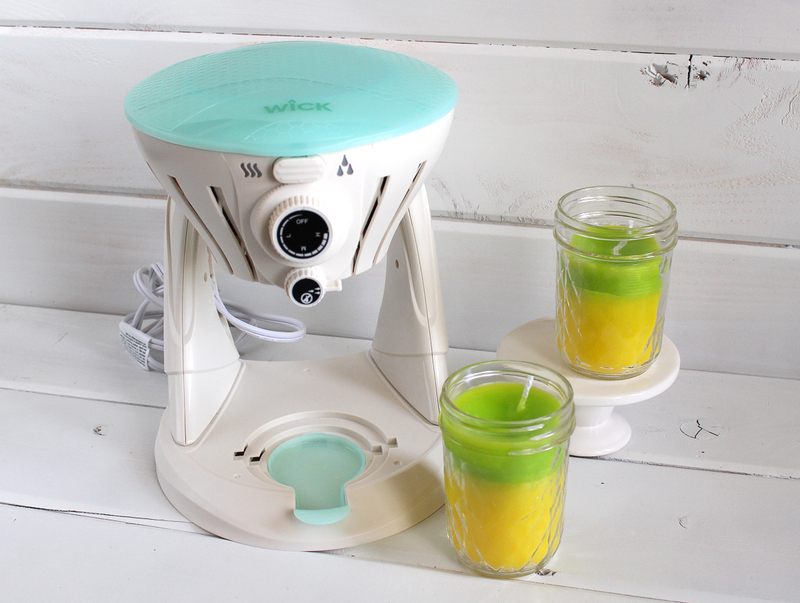 The Wick Candle Maker made the job very easy and with almost zero spills! I love my Geometric Candles! What kind of candle would you like to make? Hello, We R fans! 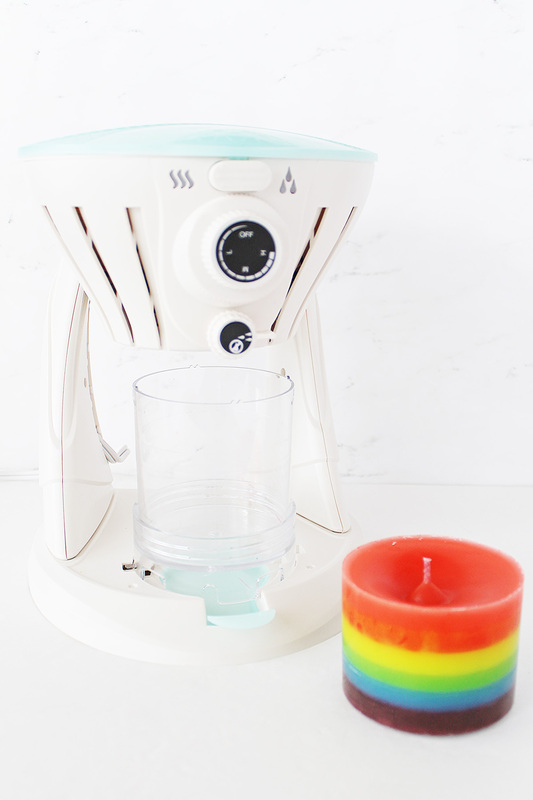 Laura here today sharing how to create this fun layered rainbow candle using the new Wick Candle Maker. 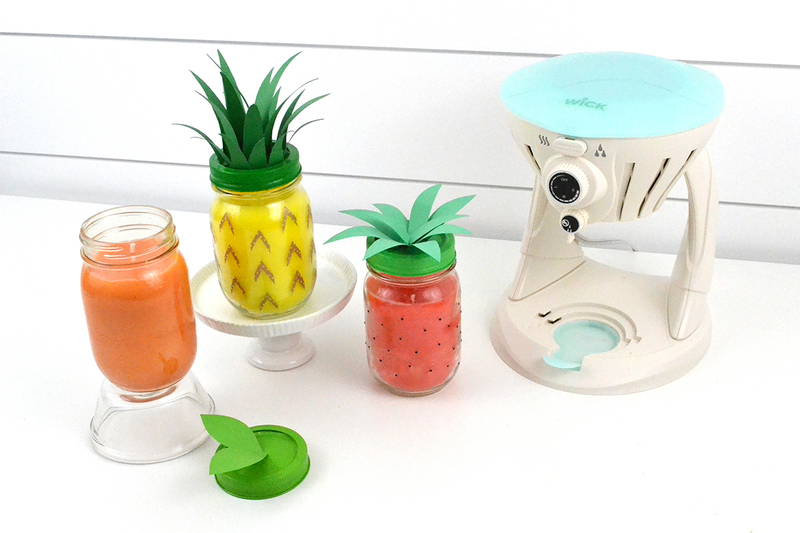 This tool makes it so easy to create your own candles. 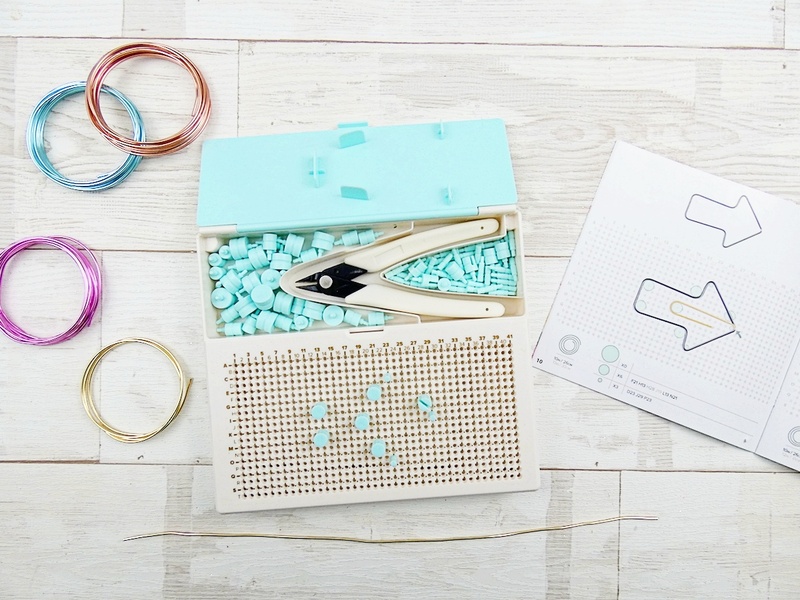 You can start creating candles right away because everything you need is included right in the box! I am very sensitive to smells and often I can’t buy scented candles even though I love to use them in my home décor. 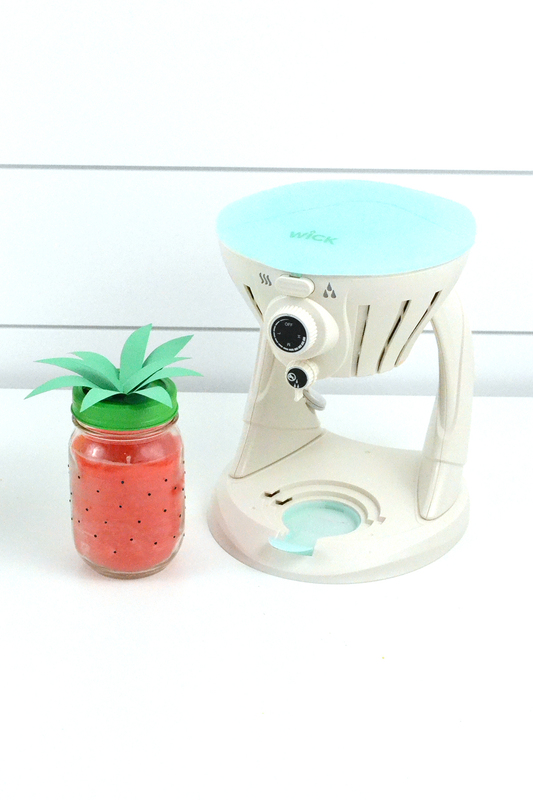 With the new candle maker, I can create my own candles that are either unscented or use essential oils to add scent. 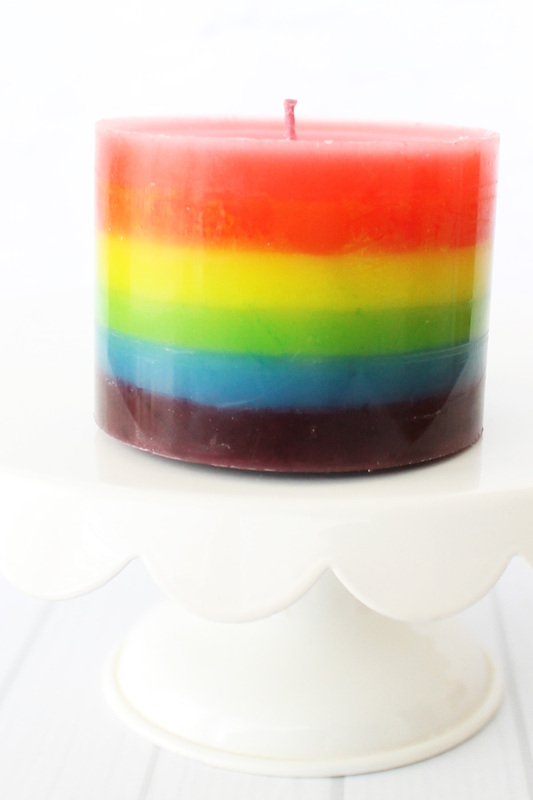 I love everything rainbow, so I thought it would be fun to create a layered candle with a rainbow pattern. To start with I used the large candle mold. Be sure the mold is screwed in securely to the base. Then, add the wick to the hole in the bottom. Leave about 2 inches of the wick at the bottom and insert the rubber stopper. 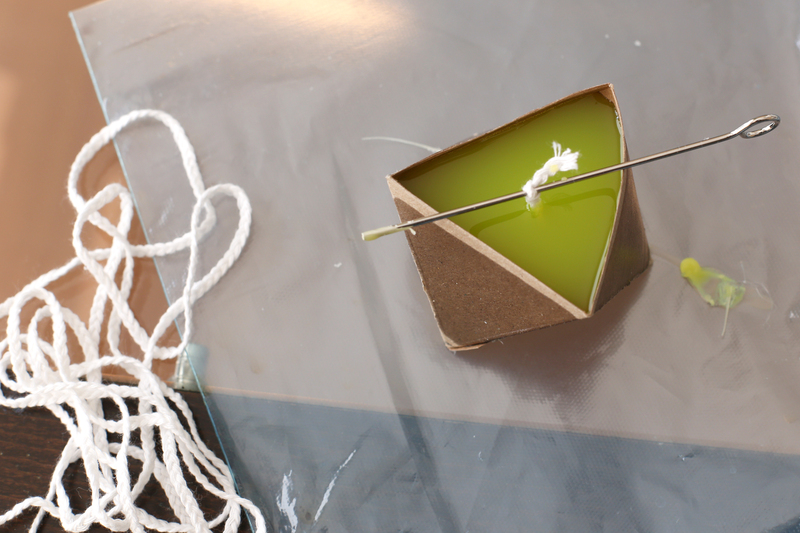 Tie the wick to the metal rod and trim off the excess. The candle mold has little groves at the top to hold the metal rod in place. Be sure the candle maker is turned off and the drip valve is closed. 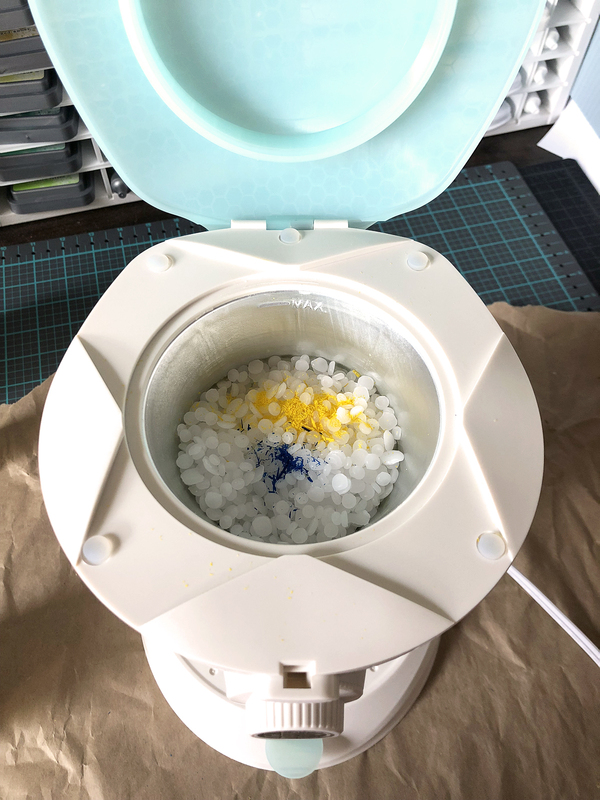 Add ¼ cup of wax granules to the hopper. Add a small amount of color dye using the color guide to determine how much of each color you need to add. You really don’t need much! Turn the candle maker on high and allow the wax to melt for about five minutes. Stir it with one of the extra metal rods. Add more color if necessary to achieve the desired shade. Once the wax is fully melted open the wax dripping valve. Allow all the wax to drain out of the hopper. I used the metal rod to stir it to help get all the wax out. 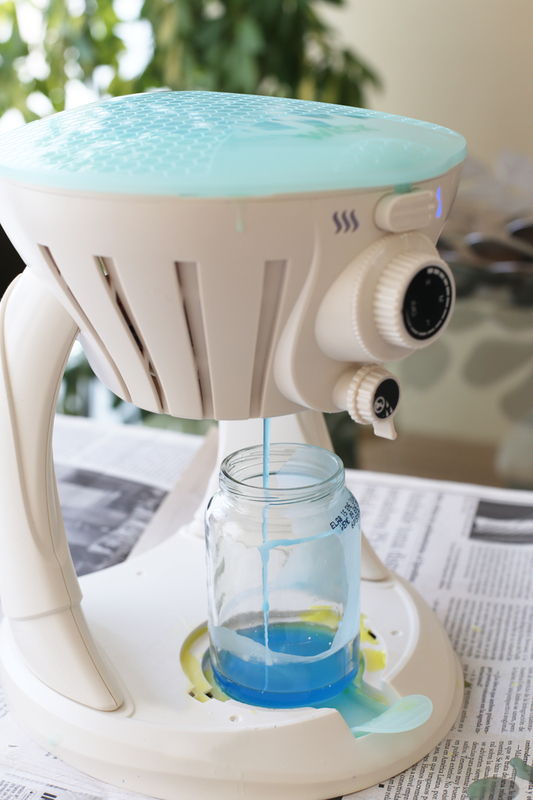 Wipe any excess melted wax out of the hopper with a paper towel. Allow each layer of wax to cool for about 15 to 20 minutes and then continue with each additional color. I did six layers of wax. Allow the candle to cool overnight and then unscrew the bottom from the mold. Push the candle out from the bottom. 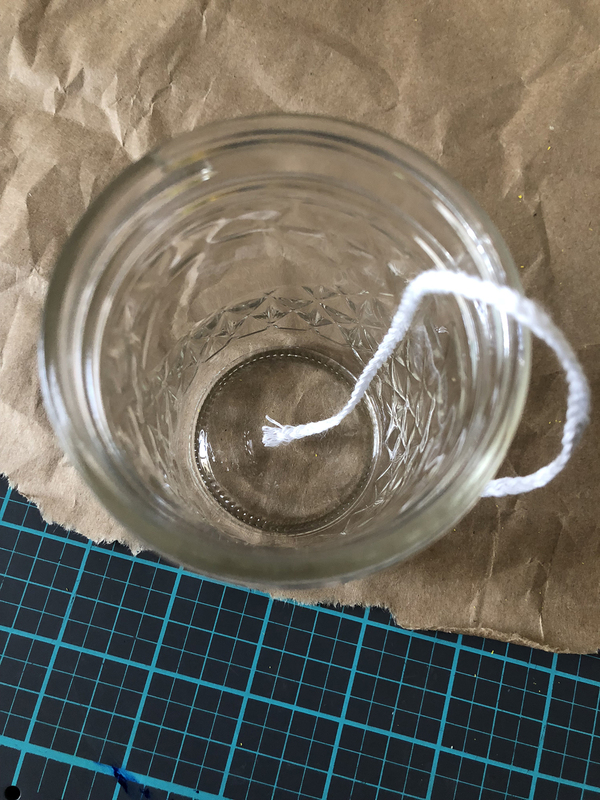 Trim the excess wick off the bottom and trim the top wick to about ¼”. The instructions talk about doing a second pour because the candle can kind of sink in in the middle. However, I was worried that I wouldn’t be able to match the red again and so I left it as is. 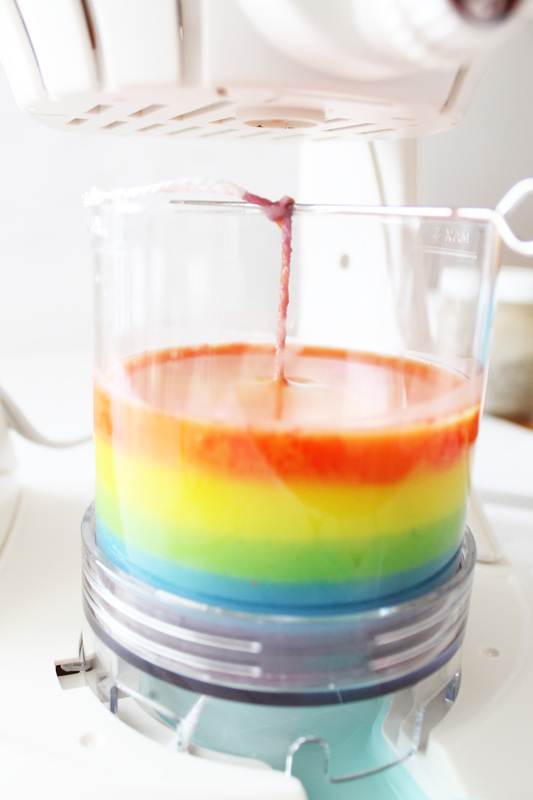 This rainbow candle will go perfectly in my craft room! I can’t wait to make more candles. 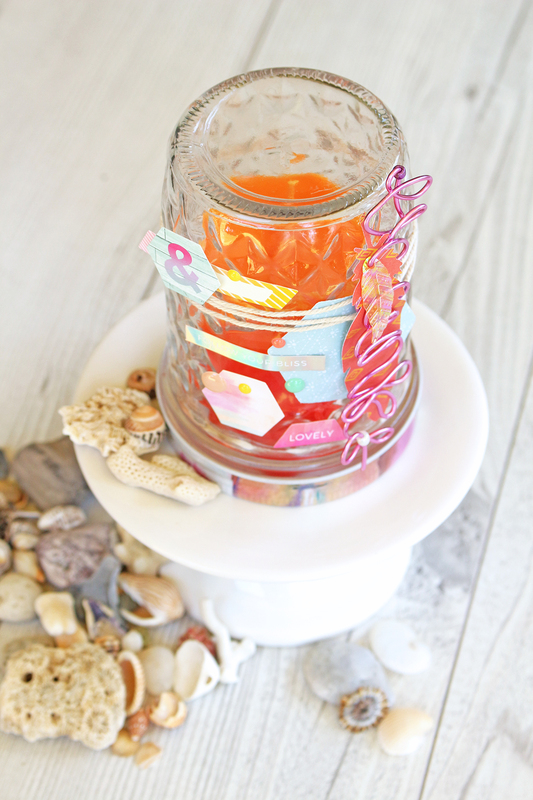 The kids want to try making a layered candle with different scents added to each layer.